My debut flash fiction collection (Chapeltown Books). Medieval Weekend recently held near Bursledon, Hampshire. My CFT post is Story Analysis - Why Bother? which is something I suspect every English Literature student has thought at some point! I look at how story analysis is useful to writers and how I do this with flash fiction. It can be done! Hope you enjoy. My Goodreads blog is Playing with Genre where I look at the joys of the crossover. That's usually thought of in terms of novels but I see no reason why it can't apply to short stories too. My CFT post this week looks at The Highs and Lows of the Writing Life, something all writers can identify with, I think! I share my thoughts on the importance of reviews and supporting author events as well as showing that the writer's journey is never on a continuous upwards line! It twists and turns, is bumpy, and goes up and down but it is the same for most of us! My Goodreads blog this week looks at Encouraging Books. What do I mean by that? I take them to be books that encourage me to read deeper into a person or subject. For example, Josephine Tey's fictional The Daughter of Time encouraged me to read more about Richard III. My CFT post this week is Experimenting with Words and Form. I look at why playing with words (including things like crosswords and playing Scrabble) is a good thing for writers to do. I also look at why mixing up what you do writing wise including experimenting with form is also a good thing. I share some favourite new words. Do share any you might have in the CFT comments box. I look at Titles in my Goodreads blog this time. I look at this with a writer's and reader's hat on (though not at the same time!). Have a good week. Pleased to say I've got another competition entry off and have selected a couple of others to have a crack at! My CFT post this week is all about Signs of Spring, the ones I love and some I loathe. Much as I love spring, I think autumn (aka fall) is probably my favourite. My monthly spot on the Association of Christian Writers' More than Writers blog spot is all about When Writing Is Difficult. I share some thoughts and tips and hope they prove useful. Last but not least, my Goodreads blog this week looks at Books to Dip Into, which is a favourite form of reading for me and I suspect many of us. Firstly, a very big thanks to all who left lovely birthday messages on my FB page. Much appreciated. Secondly, an apology. The gremlins have got to the CFT site tonight so I can't share this week's post. I've written about what I think are mankind's Top 10 Achievements. The site should be up and running again I hope tomorrow but, due to other commitments, I'm likely to share this here next week so you can look forward to a double bill! Meanwhile, I am delighted to share the link to If It's Too Good to be True, my latest Cafelit story, which was published online last weekend. Hope you enjoy it. And last but not least, I can share my Goodreads blog, The Role of Books/Stories. Comments as ever welcome on my Goodreads page. There are some CFT posts you really don't want to write but know are coming and you write them as a way of expressing apprecation for a life well lived. My tribute to Barbara Large, MBE, who founded the Winchester Writers' Festival and Hampshire Writers' Society, comes into that category. On another note entirely, my Goodreads blog this week asks When Do You Read? When not writing, authors need to be reading (it feeds the mind and kickstarts your own imagination are just two excellent reasons to do so!). And I know Barbara would heartily have agreed with that sentiment. My CFT post this week looks at some of my favourite character types and why it matters to get them right. I also look at the character -v- plot debate and why realistic portrayal of characters is so important. I'm glad to say this post has already generated a great Q&A session between another regular CFT contributor and myself so do pop over and take a look! My Goodreads blog this week is Saturday Night is Alright for Reading (yes, there is a nod to the old Elton John hit, Saturday Night's Alright for Fighting though I much prefer a good night in with a decent book!). I look at why the decline in good TV viewing on Saturday nights might be a good thing. Get the books out instead! Also looking forward to going to the Association of Christian Writers (UK) Writers' Day in Bath tomorrow, Saturday 9th March. It's always lovely meeting other writers and I've never been to one of these Days yet without learning something useful. Also due to have another story on Cafelit on 16th March. More details nearer the time. It's odd, isn't it, that January seems to last forever and poor old February whizzes by but there you go. Definitely got the short change when the days of the months were being allocated! My latest CFT post shares my thoughts on Adaptations. I discuss remakes, share my favourite adaptations but ask if they can stop good new work from coming through. I look at what makes a good adaptation (and what makes for a bad one!). Comments welcome in the CFT box. My Goodreads blog this time looks at Short Stories and Flash Fiction and why I'm glad they've made a resurgence. It isn't just because I write them, honestly! I finally get around to discussing the weather in this week's CFT post. I look at The Weather and Its Uses in Fiction and share my view on using weather in stories and how it can be done realistically. Hope you enjoy! My Goodreads blog is Hooks into Books this week and discusses what draws you into buying a book, whether it's a paperback or on Kindle. Is it the blurb or the cover? PUBLICATION NEWS: Am pleased to say Cafelit published my flash fiction piece, Dangerous Words, last week. Hope you enjoy and do check out the other wonderful wealth of stories on there! 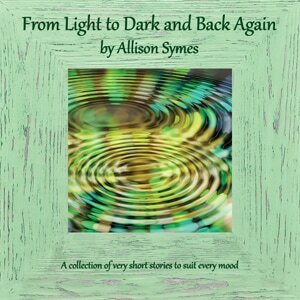 My author page here is http://cafelitcreativecafe.blogspot.com/search/label/Allison%20Symes and there will be another story on Cafelit from me next month. My latest CFT post is about Reading Journeys. I look at my own reading journey and how what I read and how I read at all has changed over the years. The Kindle has made a huge impact on me (not least of all on my suitcase when I go away as it is now considerably lighter! I have been known to take a small suitcase just containing books on holiday with me!). I don't remember what was the book I first read by myself but it is likely to be a picture book. Writers for adults owe a huge debt to those who write for youngsters, given many readers (and I think MOST) come from a background where they've always read/been read to so turning to a book to read for pleasure is a natural thing to do. It is so important to create and nuture that spark to wish to read in the first place. I link back to my CFT post from last week in a way with my Goodreads blog this week. I don't waste a good title! I "pinch" my Picture Books and Other Hooks from CFT last week for the title of my Goodreads blog and again look at my favourite books from years back. Many of these are still favourites now. Two new stories are coming up on Cafelit soon. One will be up on 16th February and another on 16th March. I'm also pleased to say two of my Cafelit stories are being voted on for consideration for the Best of Cafelit 8 due out later this year. Will share links and further news as and when I have it. My latest CFT post is an interview with local children's writer, Anne Wan. For her latest book, Manners Fit for the Queen, she teams up with local illustrator, Sally Goodden. Pleased to say I'll be having further stories appearing on Cafelit later this month and in March. Will share links later. My latest Goodreads blog looks at Series or Singles? Do you prefer the stand-alone novel or the series? Comments as ever welcome on my Goodreads page. I don't know why January seems to last forever, but it does! Still on to February which will speed by...! My CFT post is a review of the Chameleons' recent panto production of Ali Baba and The Forty Thieves. The show was wonderful and this particular post was great fun to write. I've written it in a different format to the way I usually write reviews and think this worked well on a fun topic. Loved writing it. Hope you enjoy reading it. It gives a good flavour! (Oh and the dame's hair really does have to be seen to be believed but that's the way it's meant to be with panto - oh yes it is!). My Goodreads blog this week looks at why Delving Into Your Past is a good idea for your reading "menu". See what you think. Comments welcome on my Goodreads page. Last but not least, my monthly post for the Association of Christian Writers (UK based) blog, More than Writers, was on the theme of Impact this time. I write on the 29th of each month for this and it means I get every three Februarys off!! Hope you enjoy the post. My latest CFT post The Story of Stories - Ali Baba is effectively a two parter in that I discuss in this one how I discovered the story of Ali Baba and next week's post will be a review of that as a panto recently performed by The Chameleons. I also look at why I think oral storytelling won't die out and discuss some of my favourite character types in this post and why fairytales definitely are NOT twee. So lots to get your teeth into then! My Goodreads blog this week Going Away looks at what to pack for a trip away in terms of books/what you are specifically going to read on your Kindle while away. It's been great fun being Bridge House Publishing's author of the week (which ends tomorrow). Congratulations to Jim Bates who has a signed copy of From Light to Dark and Back Again currently winging its way to him. Yes, am a night early this week, due to commitments else where over the next few days, but there is still time to take advantage of the book offers as part of the author of the week promotion. Do see the post below for details of how to contact my lovely editor to take advantage of these. My CFT post this week, Three Wishes, was great fun to write and I ask what would YOU do if your fairy godmother turned up and granted you the customary three wishes? Naturally, there are ground rules but see my post and have fun picking your three wishes. Comments as ever welcome on my CFT page. My Goodreads blog for this week looks at Good Books and what my criteria are for this. I've touched on this topic before but it's an evergreen one. What defines a good book for you? Comments as ever welcome on my Goodreads page. A very busy week this time but enjoyable nonetheless! My CFT post this week looks at Tried and Tested Writing Tips. Tried and tested by me, that is - all of the tips shared here I use regularly and many of them on a daily basis. Hope they serve you well too. My latest Goodreads blog is all about Story Idea Spotting. I look at the great game of spotting the influences the writers I read have clearly had. Great fun! And for this week, I'm Bridge House Publishing/Cafelit/Chapeltown Books author of the week. I've had the great pleasure of being published by BHP/CB in various anthologies as well as with From Light To Dark and Back Again. These form the basis of the package below. BOOK PACKAGE: There are SIX, count them SIX, publications where I have work on offer for £4.00, all as mobi-files. This includes To Be...To Become (the Waterloo Festival competition, anthology), Baubles (BH anthology), The Best of Cafelit 4, 5 AND 6 and From Light to Dark and Back Again, my first flash fiction collection. Offer ends next Friday, 18th January 2019. And for those of you who would like print paperbacks there's an offer for you too. PAPERBACK OFFER: My first published story was A Helping Hand in Bridge House Publishing's Alternative Renditions. That isn't available on Kindle BUT is in paperback and that along with From Light to Dark and Back Again is on offer at a mere £7.00 for the two! Again offer ends next Friday, 18th January 2019. FREE BOOKS! BUT YOU HAVE TO BE QUICK. UK ONLY, I'M AFRAID DUE TO POSTAL COSTS. One of the Best of Cafelit books I'm in. First come, first served, naturally. Also one book per customer. Again this offer ends on 18th January 2019 but I am hoping to have got two books off to two lucky people long before that! If you're interested email my lovely editor, Gill James, at editor@bridgehousepublishing.co.uk with your contact details. Also let her know which of the books you would like and Gill and I will take things from there. I'm looking forward to getting some books off in the post next week! All of the above books are available on Amazon and the Look Inside feature is available on most. The only one of my books not in Kindle is Alternative Renditions, that is only in paperback (but it still has one of my favourite covers!). Do check out the other wonderful stories here. You're in for a great read, I promise. I hope you had a lovely Christmas break. Happy New Year! I took a few days off and that was lovely but it is great to be buzzing to write again. My first CFT post of the year looks at Winter Traditions. I share some of mine and look at why having any at all is a good idea. I also share some of my "traditional TV" viewing (UK based) and why I won't sing changed words to certain carols! I also share some humorous versions of carols which were always sung with great gusto when I was growing up (and are well known in the UK). What winter traditions do you have and why? My first Goodreads blog is appropriately And a Happy New Year following on from last time's post. I share a few of my writing plans for the next 12 months. My latest CFT post is the last one before Christmas and, appropriately, I look at Christmas Stories. I include the Nativity, Hogfather, and A Christmas Carol amongst others. I also discuss the role of books and stories and share some of my Christmas related Cafelit tales. Hope you enjoy! My latest Goodreads blog looks at my Christmas Wish List. What would be on your list?! Very pleased to say my first non-fiction piece appeared in Christian Writer this week. This is the quarterly journal of the Association of Christian Writers (UK) and I talked about the telling details which can make a huge difference to stories and articles. My latest CFT post is an alliterative one! Celebrations, Crackers, Chapeltown and Cafelit is a look back at my publisher's annual celebration event held in London on 1st December. It was great to meet friends, old and new, there. I also share some thoughts in this post on the value of reading work out loud and also of being read to - it can be great hearing a story's rhythm for yourself and then applying that to your own work. My current Goodreads blog looks at a problem many of us have - Finding the Time to Read! I am specificially planning reading time during the Christmas break to catch up on a bit of my To Be Read pile. So we are finally in the last month of the year! Where have the last 12 months gone? My CFT post this week is about a very special cookbook written by Barbara Large MBE. Barbara founded the Winchester Writers' Festival (as it is now known) and has done so much to support and encourage writers over the years. Her book is raisng funds for the Nick Jonas Ward at the Royal County Hospital, Winchester. The book is being published via Anne Wan's imprint, North Oak Press, and Anne is someone I've interviewed for CFT before with regard to her own children's series. As for the interview tonight, Barbara shares the joys and challenges of writing this book. She even shares a very delicious recipe. I forgot to add the link for my Goodreads blog last week (I was far too excited about my publication news!) so there are two now to make up for it! This week's post is Being Read To and last week's was Impact of Writing. Both are topics dear to me! In other news, as they say, I was at the Bridge House celebration event on 1st December. A good time was had by all and I plan to write about this for CFT next week so will share more details then. A busy week! My CFT post is a review of A Christmas Carol as staged by the MDG Players in the Dovetail Centre recently. A great production and one where the audience joined in! For more details see the post. My monthly slot on More than Writers, the Association of Christian Writers' blog page, was published yesterday. This month I talked about Achieving Goals. I have had two stories on Cafelit over the past few days. Consistency is one for Anne Boleyn fans and was published on 24th November. Moving On was published on 27th November. Very different in tone and style but I hope you enjoy them both. Am also looking forward to the Bridge House Publishing/Chapeltown Books annual celebration event in London tomorrow. Will be great to meet up with my fellow authors and meet some that, to date, I've only met online. A good time will be had by all! My latest CFT post is called The Light Fantastic and looks at light and dark from the perspectives of vision (including photography), mood, and fiction. Light and dark are crucial to fiction. See what you think. Hope you enjoy the post. My latest Goodreads blog is called Mixing It Up and I look at mixing things up in terms of word counts read, as well as genres. Intersperse your novels with short stories and flash ficiton. It makes for a more varied writing "diet". Am delighted to say my 75-word story called Doubting the Obvious was published by Paragraph Planet on 21st November. Hope to share more publication news next week. by Allison Symes. Published on Paragraph Planet on 21st November 2018. My latest CFT post looks at time management and time travel. I want to be better at one of them, I'll leave you to guess which one! If time travel were to become possible, when and where would you go? What would you do when there? Comments are always welcome on the CFT page. See the link. I look at Remembering in my latest Goodreads blog as I prepared this just ahead of Remembrance Sunday/Armistice Day/Veteran's Day. I discuss the importance of history and our debt to those who wrote things down at the time. Also the impact of the war poets such as Sassoon and Owen should not be underestimated. My latest CFT post touches on a timely but always topical theme. The Importance of Memories. It's timely of course as we get ready for Remembrance Sunday/Armistice Day but I also look at memories from the point of view of how they can be used in fiction writing. I also look at the impact of dementia and I think that awful disease proves beyond all doubt that when we don't (or can't) remember, we do lose something of ourselves. My latest Goodreads blog looks at Seasonal Reading. Is your reading affected by the time of year? I must admit I save Terry Pratchett's Hogfather for Christmas time and his Reaper Man for harvest time but my reading is dictated by my mood. Do I fancy reading something funny or a gripping thriller? Comments as ever are welcome at Goodreads. I'm also open to questions about writing on the Goodreads page too but you do need to be part of Goodreads first. November already! My CFT post this week is a review of the recent production by The Chameleon Theatre Company - Blackadder Goes Forth. The play condenses the iconic final series of Blackadder and was wonderfully done. It also makes a very fitting tribute to those who sacrificed so much in World War One. Many thanks to Stuart Wineberg and the Chameleons for their kind permission to use the fabulous photos in this post. My latest Goodreads blog is called Music and Stories - I like self explanatory titles! My monthly post for the Association of Christian Writers' blog, More than Writers, also appeared this week. I talk about Keeping It Simple and how it is definitely not stupid! I also have a new story out on Cafelit called Jack of All Trades. Hope you enjoy! One thing I love about writing my Chandler's Ford Today posts is when a topic gives me great opportunities to share some good music clips (from Youtube generally). The topic of books is a great one for this. So, as well as enjoying further insights from my panel (Jennifer C Wilson, Val Penny, Anne Wan, Wendy H Jones and Richard Hardie) in the final part of my mini series The Joys and Challenges of Writing Series Novels, I hope you enjoy the soundtrack too! My latest Goodreads blog is called After the End, What Next? and sums up the topic beautifully. Comments welcome over at Goodreads! News coming up this week: I'll have another flash fiction story up on Cafelit very soon (and again in November). Also I look forward to sharing my ACW More than Writers blog for this month too. My CFT post this week is Part 2 in my mini series The Joys and Challenges of Writing Series Novels. Once again, thanks to my marvellous panellists - Jennifer C Wilson, Val Penny, Anne Wan, Wendy H Jones, and Richard Hardie - for sharing their thoughts. Amongst tonight's topics is the crucial one of how to ensure each book in a series works as a stand alone book. You cannot know at what point a reader will discover your series. It is quite likely they won't start at Book 1! I discovered the joys of Terry Pratchett's Discworld with Mort, which was well into the series! My latest Goodreads blog is Images and Stories and I list some images which conjure up instant stories! Hope you enjoy. Another very busy week! My CFT post this week is part 1 of a new mini-series called The Joys and Challenges of Writing Series Novels. Many thanks to my wonderful panel for taking part in this - Jennifer C Wilson, Val Penny, Anne Wan, Wendy H Jones, and Richard Hardie. Between them they cover the genres of children's fiction/YA, crime, historical, ghost and timeslip! Some really great insights are in this post with more to come over the next couple of weeks. Hope you enjoy. My latest Goodreads blog is called Classic -v- Contemporary. Which do you prefer and why? As ever comments are welcome over at Goodreads. A huge thank you to the Hampshire Writers' Society for making me so welcome as their guest speaker last Tuesday. Many thanks to all for their likes and positive feedback on my speech via my Facebook pages. Much appreciated. Also appreciated is their very kind permission to use the photo of me taken by them at the meeting. See above. (Am I chuffed about this? You bet!). Lots going on this week. Firstly my CFT post this week is called Fantastical -v- Reality Writing. I look at how fantasy writing and reality writing (including non fiction) feed off and into each other. You can have the most fantastical setting imaginable but unless there is something about that world and the characters readers can identify with, you will switch people off. There has to be a system of government, ways of your characters getting food etc that will make sense to your reader. I call this background structure. It has to be there, generally fairly discreetly, but without it your story falls apart. Secondly, my latest Goodreads blog is called The TBR Pile. My To Be Read pile is huge, as I imagine it is with most writers. There are magazines as well as books in there! Thirdly, my monthly blog for the Association of Christian Writers' blog, More than Writers, appeared just after my last news post here. I talk about Writing Likes and Dislikes here. Last but most definitely not least, I am going to be a guest speaker at the Hampshire Writers' Society next Tuesday, 9th October. I will be talking about flash fiction and why I think every writer should try it. Looking forward to this. (Nervous and excited about it all at the same time! Hope to report on this next week via my Facebook page). The theme this week is playing with language. My CFT post is called Playing with Words and pays tribute to the late Denis Norden, whose dry wit and skills with writing the most amazing tall tales and puns I always admired. I also discuss puns and how the ability to play with words like this is something to be relished. My Goodreads blog this week also looks at Playing with Language and here I share what I think the test of a good story really is. Busy week. Firstly my latest CFT post looks at Favourite Views. I discuss views, literal and metaphorical, and discuss how to develop "the writer's eye". My latest Goodreads blog looks at Opening Lines. I discuss what an opening line needs to do and share a couple of classical favourites to show just what a "punch" they make, which is what we need to do with our own writing. I share the links here Hope you enjoy them! My latest CFT post looks at Writing Tips. I share some of those which I've found useful over the years and, in most cases, still find helpful. Hope you find them helpful too. My latest Goodreads blog asks do you read the book first or watch the film? Well...! I must admit I have done both in my time and a great book adaptation can do wonders for the book itself. The Lord of the Rings springs to mind here - the films would have encouraged people to go back to the original novels. I'm sure you can think of many other examples here. Hard to believe we're into September already. My CFT post this week looks at The Best and the Worst decisions I've made in writing and I hope it will prove to be useful. I share some thoughts on where to go to get good advice but also hope the post shows that a faulty step on the writing journey doesn't have to bring the whole thing to a grinding halt! Comments, as ever, are welcome via the CFT comments box. My latest Goodreads blog looks at Favourite Moments in stories. So much depends on the strength of the characters. What do you think? I'm glad to report I'll be taking part in crime writer Val Penny's online book launch for her Hunter's Revenge, the second book in her Edinburgh Crime series. The launch is on Sunday 8th September - it starts at midday and I'll be "on" from 3.30 pm for about half an hour. Many thanks to VAl for the invite to take part - online launches are great fun! See https://www.facebook.com/events/1708253519296563/ for further details. Plenty going on this week! My latest CFT post is an alliterative one! As Autumn Approaches is a reflective look at the season, I share some thoughts about how the season is for writers. I also discuss the importance of taking time out to look back, as my church has recently done for its 200th anniversary, but equally how vital it is to move on from periods of reflection, given what stays static dies eventually. It is also time for my monthly blog on the Association of Christian Writers' More Than Writers blog page. This time I talk about The Highs and Lows, something every writer can identify with! My latest Goodreads blog asks Where Do You Turn First? in regard to having a limited time to read so do you go for a paperback, a hardback, or your Kindle? Am currently reworking a novel I wrote some time ago. Loving falling in love with the characters all over again! My CFT post this week is The Benefits of a Good Writing Conference and is self explanatory and totally influenced by my week at the Swanwick Writers' Summer School!! Having said that, I look at how a good conference can help boost your confidence amongst other thoughts shared here. Many thanks to Geoff Parkes for kind permission to use the images of me reading at the Prose Open Mic night slot at Swanwick and the group photos celebrating the 70th anniversary of the school. It is the longest running residential writing school in the world. Also thanks to Cheryl Holland for using my phone to take the image of several of my writer friends and I having a laugh on the lawns at Swanwick. Happy times! My latest Goodreads blog is called What Do I Want from a Story? and covers any type of story in any genre. See what you think. Can you add to my list? Comments welcome in the Goodreads box. Well, I swear the Swanwick Writers' Summer School week is the fastest period of seven days in the entire year! You get there with all those wonderful courses and conversations to look forward to but before you know it, you're heading home again. As you can gather that from that, I had a fabulous time and it is fantastic meeting up face to face with writer friends I keep in contact with by social media for the rest of the year. But back to earth again! My CFT post is a lighthearted one this week and is called Books That Should Have Been Written. Comments/contributions welcome in the CFT comments box! My latest Goodreads blog is called Coming Back to Earth and suggests a cure for those back to routine blues that hit everyone whether they have come back from a superb conference or a holiday etc. My latest CFT post is Getting Away From It All. Appropriate as I am about to swan off to Swanwick Writers' Summer School for a week of marvellous courses and catching up with writer friends and making new ones! A fab time is had by all! In my CFT post, I share some thoughts on the importance of relaxing and how just writing something for the sheer fun of it can be a marvellous way to unwind for writers. The great thing too is you can always work the piece up "properly" later on and submit it but to just write something for fun is wonderful. Possibly something we don't do enough of? I've found doing this useful (a) to take a break from my main writing work and (b) to remind myself during tough patches just what it is I really love about writing - the creativity of it. I think you can lose sight of that at times. By something that is definitely not a coincidence, my latest Goodreads blog is also called Getting Away From it All and I talk about holiday reading. Just sometimes my CFT posts blend into each other beautifully without me planning it! Last week's post, Judgement Day, talked about reviews and critiques. This week's one, A Bunch of Amateurs, is my review of this wonderfully funny play written by Ian Hislop and Nick Newman and recently performed by The Chameleon Theatre Group. A good time was had by all! Ben Williams, who also writes reviews for Chandler's Ford Today but from the younger generation's viewpoint, and I were delighted to see snippets of our reviews from the Chameleons' last performance, April Trio of Plays, were in their programme for Amateurs. The word spreads! As ever, many thanks to Lionel Elliott and the Chameleons for the splendid pictures. My latest Goodreads blog is called Heatwaves and Reading and I discuss whether the weather can affect what you read. It is unusual for the UK to have a sustained period of very hot weather, as we are at the moment. There's a reason why we're a "green and pleasant land" - it rains! My latest CFT post is called Judgement Day, but I'm not referring to the blood moon due tonight! I talk about judgement for writers in terms of reviews and critiques. I share hints and tips as to what to expect from a critique you may have asked for (many writing competitions offer feedback like this now for an additional fee) and also on writing reviews yourself. This post will feed in beautifully to my one for next week when I will be reviewing a local theatre production! Talking of which, many thanks to the Chameleon Theatre Group for quoting some of my most recent reviews in their programme (and also those of Ben Williams, who also reviews for CFT but takes a different approach to me). Another lovely way of having our names in print! My latest Goodreads blog asks How Influential are Book Titles for You? I also share some of my favourites. Do send yours in via my Goodreads blog spot page. Link above. I've also set up an author page on Book Bub. You need to join them to access any of the author pages, including mine, but this is free and they do send you details of books you may be interested in (once you have let them know what you are interested in, of course!). Many thanks to Wendy H Jones for flagging this up. Naturally I've been able to post a From Light to Dark and Back Again link on this new page. Plenty to share tonight. Firstly, my CFT post Out and About - Summer 2018 is a reflective one on some lovely areas local to me where I've really enjoyed walking my young collie. We have a beautiful wildflower meadow in our area and I hope you enjoy the pics. Secondly, I was delighted to be a guest on Val Penny's Book Review website. I talk about my writing here - both the flash fiction and my CFT posts. All are a joy to write. Many congratulations to Lynden Wade who won a copy of my From Light to Dark and Back Again as part of the raffle run by Elizabeth Hopkinson during her Tiny Tales launch. Elizabeth, like me, loves flash fiction and fairytales - what impeccable taste! Last but not least, my latest Goodreads Author Programme blog is all about Helpful Book Reviews, something we could all do with! I look back at the recent Hursley Park Book Fair in my CFT post this week. I share thoughts, pics and suggest one great way for non-writing friends and family to support the writers in their life is to pop into any events your writer is at to show some moral support. Trust me, it is appreciated! The Fair went well and this report gives a good run down on what it was like to take part. Many thanks again to Glenn Salter aka Simon Fairfax for the hard work behind this. My latest Goodreads Author Programme blog is What Makes a Character Work for You? Comments very welcome on Goodreads. My latest CFT post is Part 2 of my Why I Blog article. It has been fascinating to read the different takes writer friends of mine have taken on this topic. Do see what you think and comments, as ever, are welcome in the CFT comments box. I will be reviewing the Hursley Park Book Fair next week. My latest Goodreads post is about Book Accessories. Comments welcome in the Goodreads comments box. I am also open to taking questions about flash fiction on my author page here so do send them in! Had a wonderful time at the Hursley Park Book Fair last weekend. Chatted to many, sold some copies of From Light to Dark and Back Again, and gave a talk on flash fiction to a small but appreciative audience. I will be writing a review of this for Chandler's Ford Today in a couple of weeks time. Meanwhile, tonight's CFT post is Part 1 of a 2 part series calledWhy I Blog. Many thanks to my guest writers for taking part in this - and there will be more insights next week too. Comments are, as ever, welcome in the CFT comments box. It is also time for my latest Goodreads blog - and tonight's one is called What Does Reading Do For You? Comments are welcome via Goodreads. And last, but definitely not least, it is time for my monthly blog on More Than Writers, the blog spot for the Association of Christian Writers. This month I ask Should We Resemble Our Characters? Food for thought there, I think! 1. Pop into your writer's friends book event and say hello. (Many thanks to friends who've done this for me, it really is appreciated). 2. Read and review our books. The great thing is reviews don't have to be long but they must be honest. Say what worked for you, what didn't etc. My latest CFT post is a reminder one about the Hursley Park Book Fair taking place this weekend - 23rd and 24th June. It will be the biggest event I've taken part in to date - 50 authors are taking part. I'm also looking forward to giving a talk on flash fiction - what it is, why I love writing it, and the joys of it from a reader's viewpoint. Looking forward to meeting other authors and listening in to some of their talks too. Am preparing this a little in advance as I am about to take a short break but next week's CFT post is prepared and scheduled to go out on the 15th. It will be all about the Hursley Park Book Fair which is on 23rd and 24th June. About 40 authors, some of whom I've interviewed for CFT, are taking part and it is the biggest book event to date I've been involved in. As well as hopefully selling From Light to Dark and Back Again, I will be giving a talk on flash fiction and its joys from both a writer's and reader's viewpoint. I'm setting the link to take you to CFT's blog page. As ever with these things, the most recent article is at the top so if you click on this on the 15th, it should take you straight to the post. The event itself is free and there's good parking. A whole wealth of genres is represented. The Saturday features adult fiction, Sunday is more for children, but there should be something for everyone here and I, of course, am waving the banner for flash fiction. My CFT post this week discusses why you should not underestimate how long it takes to get a book "out there" in terms of both writing it and then marketing it. Marketing gobbles up so much time but it is vital. Richard Hardie, YA author of Leap of Faith and Trouble With Swords, shares an update on his group, Authors Reach. If anyone doubted the amount of hard work needed to promote books, do have a look at this. I may be an eye opener! My latest flash fiction story, Time for a Change, is now up on Cafelit. If you like dragon stories, you'll like this one. Hope you like it. Hard to believe we're at the halfway point in the year already! My CFT post this week looks at online writing. I ask whether it will kill off print publishing (eventually) and share a summary of what I think are the major changes in writing over the centuries. Comments are welcome in the CFT comments box. I am delighted to say my flash story, Progressing, is one of the winner in the Waterloo Arts Festival Writing Competition. The Festival has been going for some time but the writing competition is new and I hope will end up being ongoing! I am only sorry I can't be at the special event being held in June but am pleased that some of my writing friends from Bridge House Publishing and Cafelit are also in the anthology and will be attending. I hope everyone has a wonderful time. I am going to be at another inaugural event in June though, which will be the Hursley Park Book Fair. About 40 authors are taking part in this covering a wide range of genres and it will be the biggest event I've taken part in to date. I will be giving a short talk on flash fiction here too! Parking is free, the event itself is free, and I will be posting more about this on CFT a little nearer the time. Am glad to say the banners for the event are up in Hursley itself now and look great! I finally made it to the last few items in my 101 Things to Put into Room 101 series. Amongst the final pieces to go into the vault of doom are fake sincerity, debt, and all the calories in a 99 icecream. (For non-UK readers, this is vanilla icecream in a cone with a chocolate flake added to it - a huge summer favourite here). I'm also pleased to share the link to my page on Scriggler, which is US based. I haven't posted anything here for a while due to writing commitments elsewhere, life getting in the way etc, but I am pleased to be back on this. I share a new story, Night Fright, on here and I am thrilled to bits that my take on the Wizard of Oz story, Not the Way to Go, has proved a hit. My Chandler's Ford Today post for this week is the penultimate one in my 101 Things to Put into Room 101 series. I have had no trouble finding 101 things, which probably says more about me but never mind! Included in tonight's list are ripped jeans, "easy" to open packets, and the ability to lose scissors. The latter is a real pain when trying to deal with said "easy open" packets! In other news, I am glad to announce I am one of the winning writers whose story will be appearing in the Waterloo Festival anthology being produced by Bridge House Publishing. Will post more news on this later. I review the Fryern Funtasia held on Bank Holiday Monday for my Chandler's Ford Today post this week. I don't why it is but we either have heavy rain or baking heat for this annual event. Having said that, it was good fun and it was lovely catching up with regulars on the stands. I review three different plays staged in one show by The Chameleon Theatre Group for Chandler's Ford Today this week. There was a play set against the beginning of World War One, a surreal play, and finally a mystery. Sounds a strange combination I know but it worked and the plays were all well written and excellently performed. My latest Goodreads Blog is called One Book to Rule Them All? and discusses a good "reading diet". I seldom miss the chance to get a good Tolkein reference in! See what you think and comments are always welcome. Also do send in questions via Goodreads as I tend to keep my Ask the Author spot open. Also my latest Goodreads blog asks about what childhood book had the most impact on you. Comments welcome (and on my Goodreads page especially). A busy night on the blogging front! Firstly, my Chandler's Ford Today post is Part 5 of my series on 101 Things to Put into Room 101. Amongst other things consigned to the vault of doom this time are cooking chocolate, zips that break too easily, roundabouts that are too small for purpose, and fake news. A nice mixed bag there! Secondly, I blog roughly once a week to every ten days on my Goodreads page. My latest one there is called Ten Favourite Things about Reading. Hope you enjoy! This week's Chandler's Ford Today post sees fellow Chapeltown Books author, Mandy Huggins, and I discussing networking tips. Hope you find this useful! My Chandler's Ford Today post this week consigns, amongst other things, rats, overpriced clothing for those of us with heigh issues (in either direction), and people who dislike fake flowers into the vault of doom known as Room 101. In Part 4 of my series, I reach No. 60! Comments very welcome in the Chandler's Ford Today comment box. My Chandler's Ford Today post this week shows me resuming my 101 Things to Put into Room 101 series. Do you agree with my choices? Comments are welcome in the CFT box. My monthly blog on the Association of Christian Writers' blog spot, More than Writers, talks about Real Writing = Real Characters. Last but definitely not least, I'm glad to report I have a new piece of flash fiction on Cafelit called The Art Critic. Hope you enjoy it! (And do check out the other fabulous stories by a whole host of writers here). Part 2 of my interview with Gail Aldwin is my Chandler's Ford Today post for this week. We discuss, amongst other topics, writing tips, character creation and Gail's thoughts on "real" books and ebooks. Comments are always welcome on the Chandler's Ford Today comments section (which can be found at the end of the post). Tonight's Chandler's Ford Today post is Part 1 of my interview with fellow Chapeltown Books author, Gail Aldwin. Find out about her round the world bus journey and how that has inspired her flash fiction. An unusual story to tell and am glad to share it here. In other news, as they say, I've submitted my second flash fiction collection and am waiting to hear back on that. I've recently submitted a standard length short story and hope to submit another soon. Nice to get back to that format too. Had a wonderful time at the Association of Christian Writers' Day in Derby last weekend. The topic of journalism was fascinating and I was on the Q&A panel at the end (with my focus being on writing for an online community magazine, which is what Chandler's Ford Today is all about). I'm a night early this week as I'm off to an Association of Christian Writers' Day at Derby (UK) tomorrow. I've taken a brief break from my Room 101 series for Chandler's Ford Today this week as I came to a topic which deserves a vault of doom all to itself - the frustrations of publishing! I'll resume the Room 101 series in a couple of weeks as tonight's post leads into a fab two-part interview with fellow Chapeltown Books writer, Gail Aldwin. It is funny but I've yet to interview a writer whose route to publication was (a) simple or (b) easy! Nature of the publishing beast I suspect. I continue my new mini-series this week with Part 2 of 101 Things to Put into Room 101. Amongst other things consigned to eternal doom, I put in stilettos, confusing signs, and bad grammar. What would you put in? There will be 6 to 7 parts to this series but I will be taking breaks from it now and again for a great author interview coming up in the next couple of weeks or so. Also, you don't want all my (mainly humorous) moans all in one go week after week anyway! Having said that, this series is huge fun to write and I'm enjoying it immensely. Hope you like reading it - and comments are always welcome via the Chandler's Ford Today comments box. You don't have to be in or near the area to comment. In other news, as they say, I did set up a Goodreads Author Programme blog and I post to this roughly once a week to ten days. Topics covered so far are What I like in a Book Review, Book Recommendations and Short Stories Pack a Punch (and they really do!). My latest Chandler's Ford Today post is the first part in a new mini-series by me called 101 Things to Put into Room 101. I cover 15 items in this post. See what you think - do you agree? What would you put into the dreaded vault of doom? Funny answers particularly appreciated! The post was great fun to write and I'm looking forward to writing the rest of the series. In other news, as they say, I've finally sent my second flash fiction collection off to Chapeltown Books. Now to wait and see! My latest Chandler's Ford Today post is Writing Sayings - Truth or Nonsense? I share my thoughts on some well-known sayings relating to writing, including "write what you know" and "never judge a book by its cover". I also suggest a couple of new sayings that could be added to the canon of writing "proverbs". Comments would be very welcome in the CFT comments box (and you don't need to be in the area to respond). Part 2 of my interview with crime writer, Val Penny, is my Chandler's Ford Today post for this week. Also a big thanks to fellow Chapeltown Books author, Gail Aldwin, for sharing the news about books by Alyson Faye and my own From Light to Dark and Back Again. Much appreciated. My latest Chandler's Ford Today post looks at why creativity is good for you and how it benefits science as well as the arts. Am a night early this week with my Chandler's Ford Today post. I look at how non-fiction can inspire some wonderful fiction in my post called Facts and Fiction. I share why a working knowledge of history and how things work can be really useful to story tellers and that fiction, given it is rooted in truths (truth of what people are like and so on), willl always be stronger when backed by non-fiction. A busy night tonight. Firstly, my Chandler's Ford Today post this week looks at music and moods and how I now avoid having my mood changed when writing. (It does depend on what I listen to!). I share some of my favourite pieces too and why I used Saint Saens Danse Macabre as the music for the book trailer for From Light to Dark and Back Again. Secondly, I was interviewed a little while ago by fellow Chapeltown author, Aly Rhodes (aka Alyson Faye). Her Chapeltown book, Badlands, is due fairly soon (though is available now on Kindle). Her interview with me is now up on her blog and many thanks to her for hosting me. (It's always nice when the boot is on the other foot!). Happy New Year! I hope you had a lovely Christmas. My first Chandler's Ford Today post of the year is another in my Hidden Hampshire series. I take a look at a lovely, local woodland walk and share details of some of the wildlife seen there. Well, I say seen. With a dog, you are more likely to HEAR wildlife (running away!) rather than see them but the walk is beautiful all the same. Good way to walk of some of the old Christmas dinner etc! Busy night tonight and a good way to wrap up for 2017! Firstly my monthly blog for Association of Christian Writers' blog site, More than Writers, is now up on site. I look at what starts Christmas for me and why the story of Herod rings so true. People preparing to keep their position by committing murder etc - well it is not a new phenomenon, unfortunately. Secondly, my weekly Chandler's Ford Today post is now up. I look at personal reviews and share how they can be useful for writers in generating characters. Non-fiction writers can use personal reviews too. My Chandler's Ford Today post this week is part 2 of my interview with paranormal historical fiction writer, Jennifer C Wilson. She shares her thoughts on the joys and woes of writing ghost stories and crossing genres. She discusses the research she carries out and reveals what it was like to go to Richard III's funeral. How many historical fiction writers can claim to have gone to the funeral of their subject several centuries later?! In other news, as they say, don't forget you can put questions to me over flash fiction writing, blogging etc, via the Goodreads Author Programme. Would love to hear from you. My Chandler's Ford Today post this week is Part 1 (out of 2) of my interview with paranormal historical fiction writer, Jennifer C Wilson. She creates a world where the heroes are ghosts and Richard III gets a MUCH better write up than he ever had from Shakespeare! Jennifer also shares her three top tips for writers, what her trigger for writing was, and names her own favourite historical fiction writers. More next Friday when, amongst other topics, she shares the joys and woes of crossing genres and how being able to go to Richard III's funeral influenced her writing. Just how many historical fiction writers get to go to the funeral of their leading star is debatable but there can't be that many! Many thanks, Jennifer, for your time and for sharing some great insights. Looking forward to sharing Part 2 next week but in the meantime here's the link to Part 1. My current CFT post takes a look back at the 10-year anniversary celebrations held at Winchester's Discovery Centre last weekend. A group of local authors, including me, took part in this. The Centre is one of the loveliest buildings I've visited. Got to chat to people, sell a few copies of From Light to Dark and Back Again, and am always pleased to see people take postcards about the book. (Great advertising, which also doubles up as a very handy bookmark!). Also got to read a couple of stories from the book out. One lady kindly said how nice it was to be read to - how often as adults do we have this joy? I suppose only if we listen to audiobooks regularly but there is something special about being read to specifically. Hope to read from the book again tomorrow at the Bridge House/Cafelit/Chapeltown Books/Red Telephone celebration event in London tomorrow. Will be great to meet up with fellow BH, Cafelit and Chapeltown authors again. My latest CFT post looks at pivotal moments in British history and is the start of a new occasional series from me. I start by looking at the Battle of Bosworth in 1485, which really did change everything. Its relevance to Hampshire, my county, is stunning. Our county symbol is the Tudor Rose. Had Richard III not been defeated, we would have a very different symbol! I also look at how events such as this are often not as commemorated as perhaps they should be. I also look ahead to an interview with friend and fellow writer, Jennifer C Wilson, who, like me, is a white rose Ricardian and who writes about Richard in her paranormal historical fiction. Her interview will come up in December. Meantime, I'm off to the Winchester Discovery Centre tomorrow from 10 am to 4 pm as they celebrate their tenth anniversary. There are a wide range of activities throughout the day, including a local authors spot. I will be giving a short talk and readings at 11.45 am but will have a book stand there all day so if you are in the area, do pop in. If you would like to know more about flash fiction and/or writing for the small press and online magazines, do come over and chat. My Chandler's Ford Today post this week looks at local communities and writers helping each other. What are the benefits to each other? I talk about sponsorship, how having events (often sponsored) raises awareness there is a writer community within the larger community, and share news of another event I will be involved in soon, with other local authors. Next week (25th) I'll be taking part in Winchester Discovery Centre's 10th anniversary celebrations, along with my fellow writers, and there will be readings and presentations. Should be fun. Hope to post more on this later. This week's CFT post came about as a result of our local Book Fair (which went well), the closure of local businesses (including a branch of a major bank), and other businesses moving in leading to a lot of changes in my area (though some of these changes are positive, including one (gift) shop stocking books, including mine. We lost our independent book shop a while ago and things like this development are a way of keeping books available in the area). In other news, another step on the writer's journey for me! I'm a character in a book, Winter Writerland, (with my blessing I hasten to add!). I met Beatrice Fishback at Swanwick Writers' Summer School this year and, along with Jennifer C Wilson, Fiona Park, Val Penny, and me, the five of us came up with ideas for a cosy mystery, which Beatrice has now written up as a novella. It is currently in e-book form only but a paperback is planned. Am very glad to share the link. Can't tell you if I'm the murderer or not (as at the moment even I don't know and I wouldn't say if I did! No plot spoilers here thank you!) but I never thought I'd write that sentence in a blog post. The writing life can take you down some very interesting avenues at times! Saturday 28th October was a busy but creative day. Not only was there the Book Fair in the morning, I went to The Chameleon Theatre Group's staging of Murdered to Death by Peter Gordon in the evening. My review is this week's Chandler's Ford Today post. It was a highly enjoyable play, very well performed, and in my post I also talk about what I look for in a good spoof. Glad to say local gift shop MIBI are now stocking From Light to Dark and Back Again and Trouble With Swords and Leap of Faith by friend and fellow writer, Richard Hardie. I hope to write a CFT post soon about local communities supporting their writers and vice versa. My latest blog is up on the Goodreads Author Programme page too. Do send in questions via the Q&A spot. Glad to report last weekend's Book Fair went very well. There was a wide variety of authors and genres represented, including me. My report on it forms my post for this week's Chandler's Ford Today blog and has plenty of pictures (via slideshows) which should give a "flavour" of the event. I very much hope this is the first of many such Book Fairs. Chandler's Ford lost its independent bookship some time ago and a Fair like this can plug the gap a little bit. It also means we can offer a wide range of books written by local authors to local people, which is lovely. On a personal note, I am glad to say my family has found another border collie to rescue. We bring home the lovely Lady tomorrow (Saturday 4th November). It is funny how things have worked out. There was about a month's gap between losing our first dog, Gracie, and adopting Mabel. It will be about a month again between losing Mabel and adopting Lady. Another book event this week! My Chandler's Ford Today post is a quick reminder about the Book Fair taking place on 28th October 2017 betweeen 10 am and 12 noon. A wide range of authors and genres will be representeed, including me. Do drop in if you can. Would be glad to answer questions about flash fiction, local creative writing classes and so on. Book events can sometimes be like buses - none for ages, then two on top of each other! My Chandler's Ford Today post this week shares a report on how YA fantasy author, Richard Hardie's book signing event at Eastleigh Library went last weekend. The event was part of the local Cub/Brownie Uniform Day and the nationwide Love Your Library Week. I share my thoughts on how libraries and writers need each other and Richard reports on what he feels libraries can do. Support your local library! My latest Chandler's Ford Today post looks at the importance of book launches to authors and shares Anne Wan's report on her recent event at Waterstones in Southampton. Anne writes the Secrets of the Snow Globe series for children and I interviewed her for CFT a little while ago about the joys and woes of writing children's fiction. I had hoped to get to Anne's launch but sadly couldn't in the end so in some ways this is an odd post given I am sharing a report on something I couldn't get to but from what I read from Anne, my reaction was to wish I REALLY had been able to go after all, which is one sign of a good launch! You also can't beat the dedication of Anne's illustrator either but see the post for more on that! In further news, as they say, I am, now on the Goodreads Author Programme and will be blogging there once a week or so. There is also an author's Q&A slot and I love those so if there is anything you would like to know about flash fiction, blogging, writing etc, please send your questions in there. Not a good week as sadly I had to have my lovely border collie, Mabel (aged 13), put to sleep. I mention her in my latest Chandler's Ford Today post which talks about the changing seasons and my love of autumn. I do love the US term of "fall" for autumn - it's to the point! I go on to discuss my appreciation of the changing colours, cosy nights in reading and so on. What are your favourite seasons and why? Do write in to the CFT comments box. One thing I forgot to share recently is an interview Gill James conducted with me as part of her Blog . I share the link below. My latest Chandler's Ford Today post is a general overview of the recent Hiltingbury Extravaganza. I share a little about what it was like to be behind one of the stalls this time (the local writers' one, what else?!) and take a peek at some of the other popular events and attractions that were on offer. It is the first time the event has held a writers' stand and it was lovely all of us behind this all sold copies of our books. We surprised a few people who hadn't known there were so many local writers banding together to support each other. Clearly a word that needed to be spread then! It was a good fun event and I hope we can hold a writers' stall there again in the future. Part 2 of my Chandler's Ford Today interview with Gill James looks at what Gill feels are the joys and woes of writing historical fiction. She also shares some useful advice for writers new to the genre. We also discuss censorship, including the self-imposed variety. Many thanks to Gill for sharing a wealth of wonderful information. I hope to write other "writing in other genres" posts for CFT later in the year, including on crime and ghost stories, so more details when I have them. Also, I will be at the Hiltingbury Extravaganza on Sunday, one of a team of local authors on the book stall, so if you can pop along, we would be glad to see you. I discuss historical fiction with Gill James for this week's Chandler's Ford Today post. Her book, The House on Schellberg Street, is a series of round robin letters sent betweeen young German girl friends during the rise to power of Hitler and throughout World War Two. The letters are based on factual ones. Amonst other topics, Gill and I discuss why invent historical stories when history itself is full of real ones. Part 2 next week will see Gill offering wonderful advice to writers new to the historical fiction genre. My latest Chandler's Ford Today post is a reminder one about the children's poetry competition Chandler's Ford Authors are running in conjunction with Hampshire Libraries and the Hiltingbury Extravaganza 2017. (This year that will be on 17th September). The theme is Where I Live and the age ranges are 8 to 11 and 12 to 15. The post gives more details on how to enter. Good luck to all who do! Back from a short break at the wonderful Swanwick Writers' Summer School and pleased tonight's Chandler's Ford Today post is on one of my favourite aspects of writing - humour in fiction, which is, I think, the toughest of all to get right but so rewarding when you do. I share some classic UK clips (TV and radio) which I feel show some truly brilliant comic writing. I also think I've found my all time favourite feature image for this post. See what you think! Glad to share news of my latest Chandler's Ford Today post which is all about a children's poetry competition being organised by my local wriitng group, Chandler's Ford Authors, in association with Hampshire Libraries and the Hiltingbury Extravaganza. There are two age categories - 8 to 11 and 12 to 15 and there are prizes. More details in the post but we all hope it will encourage a lot of creativity on the theme of Where I Live. My latest Chandler's Ford Today post looks at collecting books. This post came about as a result of my clearing out my late mother's collection and discovering some very nice surprises. I also discuss what is Charles Dickens' worst book and whether there really are only 7 basic plots. Tonight's Chandler's Ford Today post looks at writer co-operatives and introduces a new one, which I'm pleased to be part of - the Chandler's Ford Writers' Hub. Later in the year, we hope to run a poetry competition as well as take part in events. Alll good stuff! My latest Chandler's Ford Today post is called Revisiting Medieval Hampshire in 2017. I went to a Medieval Weekend run by the Road to Agincourt Project at River Hamble Country Park. The picture above is taken from the one I went to last year. I talked to some of the villagers who explained what their roles were and I learned about the history of pub games and what different arrows were used for amongst other things. The post is an overview vof a fun event I hope they repeat again next year. I look back at my first ever book signing held on 8th July at Chandler's Ford Railway station in my CFT post tonight. I also look at why signings are important - and not just for the author concerned. Apologies for the break (due to a much needed break, some pun intended!). I will put up the link to Part 2 of the Anne Wan interview another time but two bits of news for tonight. Firstly I'll be holding my book signing for From Light to Dark and Back Again tomorrow (8th July) at Chandler's Ford Railway Station from 9.30 am to 12 noon or thereabouts. If you want to find out more about flash fiction and you are passing by, do drop in. Would love to chat. There will also be giveaways and I hope to read some of my 100 words stories.Many thanks to the Three Rivers Rail Community Partnership for their support. Secondly, I'll be back at this year's Medieval Weekend in Bursledon over next weekend (15th and 16th July) and tonight's Chandler's Ford Today post is all about that. The Road to Agincourt Project, who are behind the weekend, are launching a Virtual Museum this year. Am looking forward to finding out more about that. My latest Chandler's Ford Today post is Part 1 of an interview with Anne Wan, children's author (Adventures of the Snow Globe: Vanishing Voices.). Part 2 follows next Friday and will include Anne's love and loathing of editing. I seriously doubt if there would be any writer who would disagree! I look forward to sharing that post next week but in the meantime, this section gives a very good idea of the hard work needed to write and publish a book. Sorry for the short break but this has been due to a family bereavement. Am slowly getting back to usual writing slots. My new Chandler's Ford Today post is all about one-liners. I look at how I use them in generating story ideas. Tonight's post for Chandler's Ford Today is one I've wanted to write up for a while. I look at the importance of children's fiction for all writers. My latest Chandler's Ford Today post should resonate with all writers with books "out there", as I focus on the art of the book review. I share my thoughts on why honest reviews are vital and really do help writers, and also share some wonderfully acerbic comments from the very truthful Mark Twain! (These are highly entertaining but you would not want to be on the receiving end!). Day later than usual this week! My new Chandler's Ford Today post reviews A Comedy Trio by The Chameleon Theatre Group. Three short plays, a mixture of farce and a a countryhouse murder spoof were great fun to watch and it is the first review I've written where I've reviewed three things in one evening! My Chandler's Ford Today post for this week explores great themes. When I write stories, I take two approaches to theme. Sometimes I deliberately write to one. Other times I focus on the character and follow what they do/say and the consequences and then the theme emerges from that. I look at themes in stories and music here and, without having planned this, a lot of my musical tastes are included in this post. Everyone from Dave Edmunds to Maria Callas, in fact! Great stories in their music. Hope you enjoy. Firstly, my latest Chandler's Ford Today post is based on a writing exercise I was set at last year's Swanwick Summer Writers' School. Advice to My 20 Year Old Self sets out what I would tell my younger self if I could - the first thing was to lighten up! What would YOU tell your younger self? Comments are very welcome in the CFT comments box. Secondly, I am pleased to say there is now a Facebook page for From Light to Dark and Back Again. Naturally I will post interview, launch news etc etc here. I will also put up posts that related to the book in some way. For example, tonight, I have posted a piece about reviews and a separate post on what part of a story I like writing most. The book trailer is also available to see here. My Chandler's Ford Today post tonight is Cyberlaunch Lessons and takes a look back at what I learned from the recent cyberlaunch of From Light to Dark and Back Again. I really hope this will be useful to other writers thinking of having their own launches. Also glad to report the Kindle version of my book is currently available for 99p! My latest Chandler's Ford Today post is on a perfect topic for a fiction writer to blog about - a Storytelling Festival! The Festival is from 10th to 22nd April and includes creative writing workshops, a special screen showing of Roald Dahl's Fantastic Mr Fox and the Story Shuffle app, which I wrote about a while ago, now being available for the public to try at 10 local libraries. More details in the post. Hope everyone who goes has a lot of fun with this. My main Chandler's Ford Today post this week is part 2 of my interview with Martin Kyrle. His book, Jottings from the Trans-Siberian Railway, is a fascinating insight into a part of the world most of us only know by name. It is also very funny. I can also guarantee you will think twice before complaining about the cost of toilet paper when you read Kyrle's Law on the Public Bog! Two bonus posts for this week. One is my Association of Christian Writers' piece for the month called Telling It How It Is. I share my love of the Psalms for their honesty and passion. If ever there was a book where writes poured out their souls, this is it! The other post is a bonus Chandler's Ford Today one and is called What is a Cyber Launch? This is for those new to the idea and came out of a discussion I had at a new local writing group. I will share my main post - the rest of the interview with Martin Kyrle - tomorrow, hopefully. My latest Chandler's Ford Today post is part 1 of my interview with Martin Kyrle, former Liberal Democrat councillor and now published author. His book Jottings from the Trans-Siberian Railway describes a fantastic journey taken by him with friend and photographer, Michael Roberts, across Russia, Mongolia and into China. One thing I love about non-fiction writing is how it is increasingly using storytelling techniques to entertain (as well as give you the facts and figures of whatever subject you are reading about). Martin's book is a very good example of this and would appeal to lovers of travel books, railways and funny stories! Martin and I discuss the book and I give a summary of the contents. The photos in the book are stunning. The book is written as a travel diary and is very easy to read. It sheds light on a part of the world which is still wilderness (especially Mongolia). Martin also shares why he wrote the book. The second part of the interview next week will include a summary of Kyrle's Laws (including the wonderfully named Law of the Public Bog!) and what Martin would have done differently had he known then what he knows now. My latest Chandler's Ford Today post is a review of part 1 of a series of planned graphic novels about Sir Bevis of Hampton, Southampton's legendary hero. The book, Blood and Valour, is a wonderful example of literature and art. Henry V was known to read Sir Bevis's adventures on tapestries (the first comic book perhaps!) so this new venture continues a fine tradition of using pictures as well as text to tell these great tales. Sorry I forgot to post news of last week's Chandler's Ford Today article, which was about the joy of radio. I shared news of my favourite radio comedies. This week's post talks about another joy of mine - the joy of interviews. I was interviewed late last year by fellow scribe, Jacci Gooding, and I share some of her questions. I also look at why I liked these questions. Jacci's questions made me think about what I do as a writer and look back at how far I've come on my writing journey. I think the sign of a good interview is when the questions draw the interviewee out. Jacci has great talent here! I've put the links below as with this website and my Fairytales with Bite one tonight, there seems to be an issue with linking websites - at least on my News pages. I will need to take this up with Weebly later this weekend but in the meantime this seems to be a good work round. My latest Chandler's Ford Today post is called Vital History and I explain why I think it is. My Chandler's Ford Today post this week is about a Jane Austen Festival due to be held in Southampton (UK) in June and which is being co-ordinated by the Sarah Siddons Fan Club. Jane was a fan of Mrs Siddons, who was one of the country's earliest actresses (for centuries no women were permitted on stage). It is good both women were pioneers of writing and acting and that they are still remembered very fondly today. My Chandler's Ford Today post this weeks looks at Robin Hood - The Pantomime, recently performed by the excellent Chameleon Theatre Group. I share what I loved about the show and about the classic tale of Sherwood Forest's most famous and infamous resident! Am delighted to share the wonderful book cover for my debut flash fiction collection, From Light to Dark and Back Again (Chapeltown Books). Chapeltown are bringing out a series of single author collections and I'm honoured to be the first. More news as and when I have it. I hope to share extracts at a later date. I am also currently building a separate book page for this. I forgot to put a Chandler's Ford Today link up for last Friday, 20th January, but will do it now. My post then (which is not time dependent in any way) is all about Classic Books and what makes a book qualify for that status. I also list my Top 10. Book News - I chose the book cover for my flash fiction collection, From Light to Dark and Back Again (Chapeltown Books), this week. Both options were wonderful (I had sent in ideas earlier but it came down to two images being viable for this). In the end, the choice was a clear cut one and I am looking forward to sharing the image at a later date. My Chandler's Ford Today post is a kind of follow-on from last week. Classic Books focused on fiction. Tonight's post Fiction -v- Non-Fiction? No Contest! celebrates non-fiction. I talk about why it is vital for all fiction writers to read non-fiction widely and share some of the books that have inspired themes for stories. I include the Bible (I found out in the last year or so thanks to an article I read that a UK soap scripwritier was inspired here - I suspect by the story of Samson and Delilah! ), historical, science, and reference books. Besides which reading non-fiction is great for feeding the mind anyway and ideas can really spark from that. Tonight's Chandler's Ford Today post is another historically based one. From steam trains last week to Southampton's legendary mascot, Sir Bevis of Hampton this week. I've written a series of posts connected to the Road to Agincourt Project over the last year or so and tonight's one, Introducing Guy Stauber - Marvel at Sir Bevis Comic - is another in that series. Blood and Valour is a graphic novel/comic book written by Matt Beames and illustrated by Marcus Pullen and shares Sir Bevis's adventures. The real coup for them is that Guy Stauber, who has worked for Marvel, Disney and DC Comics, has also produced cover and other artwork for this project. The post talks about all this and shares some of Guy's stunning images for Blood and Valour. The graphic novel/comic book is due out in the spring and for fans of historical fiction, adventure tales and graphic fiction generally, this would be worth putting on the check it out list. 6th January 2017 - Happy New Year! My Chandler's Ford Today post this week reviews the Watercress Line, a lovely steam train run between Alresford and Alton in Hampshire. Lots of pictures, including one of a totally non-PC sign which always makes me laugh when I see it. I can't imagine who would buy the product with the name it has - see the post and see what you think! My last Chandler's Ford Today post for the year is a lighthearted one and is called Seasonal Limericks and Flash Fiction. I hope these raise a smile or two, especially given 2016 has been a difficult year. For my fellow Association of Christian Writers' members (UK especially), my blog, Making an Impression, went up on the More than Writers blog yesterday. I look at "flash moments" and discuss the role of the innkeeper in the Nativity. Maybe we should focus on making a positive impact on those around us, even if that impact is brief. I write an annual piece about Christmas for Chandler's Ford Today. My What I Like (and Dislike) about Christmas is this year's offering. One of my dislikes was the tinny so-called music played by my local shopping centre. Definitely not impressed with that! My Chandler's Ford Today post this week is an interview with local YA author, Richard Hardie (Leap of Faith and Trouble with Swords). He shares his most recent publication news, including the coup that respected independent bookshop, P&G Wells of Winchester, are now stocking his works. It is nice to write a post where I can share what a local author is up to writing wise and promote a local independent bookshop! Well, what a week! On Saturday, I went to the Bridge House Publishing/Cafelit joint book launch in London to celebrate the launch of Baubles (Bridge House's annual anthology for this year) and The Best of Cafelit 5. My story, Helping Out, is in Baubles and Telling the Time, a flash fiction piece, is in Cafelit 5. Great to meet up with Bridge House and Cafelit people. Had a wonderful time sharing marketing tips, catching up with what other writers are doing and so on. Bridge House have set up a Baubles Facebook page and on their blog spot are sharing for the 24 days from the beginning of December to Christmas Eve snippets of the stories from the 24 writers in this anthology. I was on day 7. On Monday, my story The Delivery appeared on Alfie Dog. The link takes you to my author page here and I now have 5 stories on Alfie Dog. The Delivery shares the tale of a former favoured servant of the Dark Lord who has fallen out with the boss and is now facing the consequences. And tonight's Chandler's Ford Today post, What's Your Favourite Film Theme? My Top Ten, not only tells you at once what the post is about (! ), but is a follow up to my classical music piece a few weeks ago. The latter has been one of my favourite CFT posts this year and it generated wonderful comments (and shared YouTube clips). I very hope tonight's post does the same - contributions are very welcome! My Chandler's Ford Today post tonight is The Writer's Journey and shares my publishing and writing news since I went to the Swanwick Writers' Summer School back in August. This period has been the most productive I've know with my writing to date and I very much hope to build on it for 2017. Tonight's Chandler's Ford Today post shares news of a local author book launch. Jottings from the Trans-Siberian Railway by Martin Kyrle and Michael Roberts is being launched at The Brooks, Winchester on Saturday 3rd December. The book is for armchair travellers and railway fans. I'm only sorry I can't go but it is for the best of reasons. I'll be at the Bridge House Publishing/Cafelit joint book launch for Baubles and The Best of Cafelit 5 respectively. I've got stories in both and it will be lovely to catch up with everyone again. In other news, I've just sent back the proof for my flash fiction collection. I'm very happy with how it is looking! It has been a lovely writing week. I judged the Greensleeves writing competition run by Southampton Writers' Circle. I was made very welcome. The stories were of a very high quality and I can see all of them being published after some further light editing works. I critiqued each entry and was very pleased these were appreciated. I know I've always appreciated feedback like that myself. The whole thing came about thanks to discussions with another writer (a SWC stalwart) at Swanwick Writers' Summer School this year. So networking can help! Given I am not the world's most natural "networker" I am especially pleased about this. I am also delighted to say my short story, The Delivery, will soon be up on the Alfie Dog Limited website. More details a bit nearer publication day. And last but no means least, I'm pleased to share news of my local library's events via my Chandler's Ford Today post this week. They will be holding a Books of 2016 discussion event and are also running ebook surgeries. More details in the post. Tonight's Chandler's Ford Today post is a review of the Arthur Miller play, ﻿All My Sons. ﻿ This was recently staged by the Chameleon Theatre Group and both the play and the performances were excellent. I also share some of the history of the play and its links with McCarthyism. It has also been a busy week with regard to Bridge House Publishing and their annual anthology, Baubles. My short story, Helping Out, is in there. Below is the link to the Baubles Facebook page. I've also shared the link to the book trailer. It is the first time I've been involved with one of those and I think it looks great. I love writing my Chandler's Ford Today posts but every so often, from my viewpoint at least, one item is really special. Tonight's post is one I've been looking forward to writing for some time. My Top 10 Classical Music Greats combines my love of classical music with my love of writing a list! So what would your Top 10 classical music pieces be then? Part 2 of my interview with Barbara Large is now up on Chandler's Ford Today. Amongst other issues, she shares what she would like her writing classes to achieve, what she feels are the most common mistakes new writers make and what all writers need. I've posted an update to my Chandler's Ford Today post about the Story Shuffle Project. Local school children will be writing their versions of the tales of Sir Bevis of Hampton, Southampton's local legend. These stories will then be digitised and put into the Story Shuffle app. To gain access to these stories (and a wealth of others), the children will be given a special code which they use at their local library to unlock the tales. Creative writing and encouraging library use - what is there not to like? Am delighted to say Part 1 of my interview with Barbara Large, MBE (founder of the Winchester Writers' Festival as it is now known) is now up on site at Chandler's Ford Today. Barbara runs a series of creative writing workshops in the area and, as ever, shares some wonderful advice for writers in the interview. Part 2 follows next week. Am also pleased to say I have returned the edits on my flash fiction collection to my publisher, Chapeltown Books. I am working my way through some wonderful interview questions put to me by fellow writer and friend, Jacci Gooding. Will post when I know when this will appear. I love writing for Chandler's Ford Today on a wide range of topics. My favourite themes are creative writing projects, history, and ideas that encourage the use of our wonderful libraries. Tonight's post uniquely combines all three of my favourites! The Story Shuffle Project is linked to the Berry Theatre in Hedge End, the Sir Bevis of Hampton legend (which I have written about before in connection with the Road to Agincourt Project) and Eastleigh Borough Council (who are one of the funding suppliers). The project gets local children to write their own versions of Sir Bevis's adventures, which are then put into a digital app which can be unlocked at the local library with a special "code" the children are given. Great idea and I hope everyone taking part has a lot of fun with this. More details in the post of course. I had one of the great joys of the writing life this week. I received my package of The Best of Cafelit 5, which is the latest anthology in which my flash fiction appears. Chapeltown Books are the publishers and they will be publishing my first flash fiction in due course. More news when I have it. Have put in links to both the Amazon page for Cafelit 5 and the publisher's website. On another note, my Chandler's Ford Today post tonight looks at good writing conferences. I share my thoughts on this and what I have learned from Winchester Writers' Festival, which I've been going to for many years, and Swanwick Summer Writers' School, which I went to for the first time this year. I loved it. It was the first residential course I had gone to since the Isle of Wight weekend conferences I used to go to many moons ago, which were run by Felicity Fair Thompson, whom I've interviewed for CFT in the past. Happy times! My Chandler's Ford Today post tonight is another in my Away Days series and is about the lovely Bath. Bath was once home to one of my favourite writers, Jane Austen. This post looks at the Roman Baths. In Impossible Interviews for Chandler's Ford Today I begin a new occasional series where I "interview" past historical figures. I start with Richard III and the sights of the Medieval Weekend earlier this year would have been very familiar to him. So what do you think? Was he a monster or much maligned? Tonight's post on Chandler's Ford Today is a little different for me and is probably going to be the most technical piece of writing I'll ever do. I share my thoughts on why I use Scrivener writing software. The post came about because I discovered on the recent Medieval Weekend I reviewed that the old word for scribe was scrivener, which made me smile, knowing I had used and am continuing to use the software of the same name. I also share some links to great websites of authors whose choice of writing tools were the quill and the typewriter! At the end of the day it is what the imagination comes up with that matters most but I hope this post might be of use to writers considering using this software. The second half of my Chandler's Ford Today post is on site tonight and is called A Peek Into My Writing World. This post shares why I have artificial roses on my desk, what it is I have on my desk that I call "Old Faithful" because it keeps going no matter what, just like me (! ), and looks at what inspires me as a writer. My current Chandler's Ford Today post is a two-parter and is all about flash fiction. Part 2 will appear tomorrow and will share my book publication news and reveal why I have roses on my writing desk. Tonight's post though looks at what flash fiction actually is and I share one of my examples. Hope you enjoy it. My recent Chandler's Ford Today post is a short one - just a reminder about Barbara Large's creative writing classes that are due to start in the area later this month. And on 29th August I had my first blog post called Appreciating the Small Successes appear on the Association of Christian Writers website called More Than Writers. I will be blogging for them monthly from now on, with posts due on the 29th of each month. A normal length (for me) Chandler's Ford Today post should be up next Friday. Details to follow. I am thrilled to be able say my first flash fiction collection has been accepted by an independent publisher, who has published me in anthologies before. They will also be taking my second collection, a short story one, with the idea of bringing it out in 2017. Am absolutely thrilled. It has taken a long time to get to this point but I hope that will mean I appreciate and enjoy it more. Have signed the contract and sent it back electronically. I will also be blogging for the Association of Christian Writers' More Than Writers blog regularly with the first piece due to appear early next week. So all go here but in a very positive way! The above picture (taken by me) is linked to my recent review of the Medieval Weekend held by the Road to Agincourt Project to commemorate the 600th anniversary (the celebrations have been held over two years). ﻿Part 2 of my review ﻿is now up on Chandler's Ford Today. One thing that did hit home was how fortunate I am to live in this era, for all its faults and failings. I can't imagine being illiterate. I have no doubt I would've been a peasant back then so reading and writing would've been out of the question. I've set up a Word Press blog called Allison Symes: Collected Works where I will be linking the best of my website pieces, my Facebook author page items and my Chandler's Ford Today magazine articles. I will also use this new blog to keep a rough writing jounal and I have linked the websites and my social media accounts to it as well. I am at the stage where having one central "hub" like this could prove very useful. Hope you enjoy the new blog and there will be more details as I write more for it. I only plan to put excerpts from my linked pieces on the blog so hopefully people will come to the websites, my Facebook author page etc to find out more there on the things of particular interest. The new blog will be useful for sharing my writing news more clearly as well. Have submitted a short story collection recently and a flash fiction collection in the last couple of months so plenty is going on in my writing world and I hope to share news of further anthologies I am due to appear in by the end of the year when I have further details of publication dates etc. Would You Live a Medieval Life? is my current Chandler's Ford Today post and is Part 1 of a two parter, the rest due to appear next Friday, 26th August. This is a review of the recent Medieval Weekend put on by the Road to Agincourt Project and supported by Hampshire County Council and Eastleigh Borough Council amongst others. The weekend was huge fun and I thought the actors re-enacting what life would have been like in a medieval village were very well informed. Both this post and next week's one tie in with my On the Great Ships Trail post which went up last week. So would you have wanted to live in medieval times? For me, the answer is a definite "no" but it was fun having a peep. Just back (yesterday) from Swanwick Summer School. Had a fabulous time, learned loads, made new friends and ate too much wonderful food. But this seems to be the case for almost everyone I spoke to at the School! Now back to "real life". My new Chandler's Ford Today post (which I prepared in advance, I love advance scheduling of blog posts etc, so useful) is called Following the King: On the Great Ships Trail. This discusses a newly launched walk which leads to the River Hamble where the wreck of Henry V's ship, The Grace Dieu, can be seen. This walk launch was part of a Medieval Weekend organised by the Road to Agincourt Project and next week's post will discuss what else was on show there. I review Shakespeare's Romeo and Juliet in tonight's Chandler's Ford Today post. This was the production put on by the Kenneth Branagh Theatre Company and was screened nationwide by National Theatre Live. Wonderful performances and a great message from the Bard too. Tonight's Chandler's Ford Today post is called Barbara Large: New Creative Writing Classes in Chandler's Ford. I met Barbara years ago through the Winchester Writing Conference (as it was then)/Winchester Writers Festival (as it is now). She has always been a wonderful encouragement to writers from all backgrounds, no matter what our genre is, and I hope these new classes do well. The Poetic Life: Sharing the Muse is part 2 of my Chandler's Ford Today interview with successful local poet, Sandra Gordon. She shares great tips which would be useful for poets and prose fiction writers. We also discuss the importance of editing, writing and the usefulness of writing/poetry festivals amongst other topics. Many thanks to Sandra. One thing I have loved about my interviews on CFT has been the way all my interviewees have responded so positively with the result being the articles are like a converation on screen. I've always enjoyed reading interviews like that (and inevitably learn a great deal from them). I love writer interviews as no two writers work in exactly the same way and this comes through in interviews. I find that a fascinating topic in itself. In my series of interviews on the writing life, my latest Chandler's Ford Today post features local poet, Sandra Gordon. She has recently performed some of her works at the New Forest Folk Festival and is due to be published in the prestigious The North magazine soon. Part 1 of the interview is where Sandra shares her thoughts about the role of poetry and names some of her favourite poets. Part 2 will follow next week and Sandra will share useful hints and tips for the aspiring poet. I like to write the occasional poem but admire hugely those who make it their life's writing work. The advantage of writing short stories and novels is you have so much more room in which to share your ideas! Delighted Andy Murray won Wimbledon for the second time and thrilled at the brilliant wheelchair and mixed doubles British successes too. On a personal note, am very pleased to say Bridge House Publishing have accepted my story Helping Out, which will appear in their Baubles anthology later this year. Many congratulations to all those who have work due to appear in this, link to the listing is below. Want to Become a Heritage Guide? is my latest Chandler's Ford Today post and links in with my Road to Agincourt posts over recent months. Delighted the Road to Agincourt website linked to these posts with lovely credits to CFT and myself. There will be a medieval weekend at the end of the month (I hope to go to some of it) where a new walk will be launched taking people down to the River Hamble, which was found to contain The Grace Dieu, Henry V's ship, relatively recently. Archaeologists are hard at work on the ship. Hampshire has a few links with the Battle of Agincourt which the website illustrates. My new Chandler's Ford Today post is Away Days: Salisbury, which is a great place to visit. I highly recommend visiting the Salisbury Cathedral. I always enjoy visiting the Magna Carta, one of the few original copies is housed by the cathedral, and find seeing it deepens my sense of my country's history. There's a wonderful exhibition here too showing the impact of the Magna Carta (for one thing it had a major influence on the American Declaration of Independence). Just back from a short, refreshing break. Two posts appeared on Chandler's Ford Today while I was away and were the two parts of my interview with writing friend, Jacci Gooding, who I met at the Winchester Writers' Festival a couple of years back. Jacci will be launching her short story collection, A Collection of Unsettling Short Stories, in October and the first part of the interview called Adventures in Self Publishing looks at her taking the self publishing route with this book. There is also some good advice for anyone also thinking of taking the self publishing route. The second part of the interview looks at Jacci's life as a writer. Many thanks also to Jacci for a good mention on her website. I'm starting a new mini series of Away Days from my local railway station and tonight's Chandler's Ford Today post features a journey to York and the National Railway Museum. I love trains, I love stories and the NRM combines both. My post Away Days from Chandler's Ford Station: York shares pictures and details of what can be found at the museum which includes a working model of Stephenson's Rocket and the Harry Potter plaftorm sign and all sorts of things in between! It made for a long day out but was huge fun. For Chandler's Ford Today this week, I turn from crime to going back in time. My new post called In the King's Footsteps on the Great Ships Trail shares news of a free Medieval Weekend coming up in Hampshire at the end of July. A new woodland walk will be launched during this weekend. I know - just how do you launch a woodland walk other than just going on it?! But this walk will take those using it down to the River Hamble where Henry V's ship The Grace Dieu was found relatively recently. There will be opportunities to talk to the archaeologists working on this as well and the weekend will also feature historical re-enactments. My first big love is stories, my second one is history (after all history is a form of storytelling in itself) and I do hope to get along to the weekend myself. I think the great thing about weekends like this is you can get to see something of what life was like back then and if there was anything to make you grateful for the blessings of life now, weekends like this will do it! My latest post on Chandler's Ford Today is called How to Spot A Real Writing Competition and gives advice on what to look out for, as well as sharing some warnings on what to avoid. The advice is also applicable to non-writing competitions. If in doubt, check it out! This post continues my recent mini-series on scams too. Fun Day - Fryern Funtasia 2016 is my current Chandler's Ford Today post. The Funtasia is one of our local shows and is huge fun. It was a great chance to catch up with old friends and I discovered news of a Fusion concert, which will be raising funds for St. Anne's Hospital, Tanzania who are looking to provide new toilet blocks with flushing toilets. I look forward to the day when nobody has to worry about having decent sanitation again because everyone finally does have it. But I do hope the concert is a huge success. It was good to see everyone enjoying the entertainment at the Funtasia too. My latest Chandler's Ford Today post is a review of The Pocket Dream, a play written by Elly Brewer and Sandi Toksvig, which tells the story of a cast struggling to put on Shakespeare's A Midsummer Night's Dream. The play, staged locally by the Chameleon Theatre Group, is a wonderful farce and sends up bad acting, acting tantrums and anything that could go wrong in your average production. It is is the first time I've been able to get to a production by the Chameleons and really enjoyed it. Given I write fairytale fiction, I guess if there was a play I would be pre-disposed to like, it would be Shakespeare's original here but the farce based on it is great and I hgihly recommend it. World Book Night and the 400th Anniversary of Shakespeare is my latest Chandler's Ford Today post. Not a snappy title but a descriptive and accurate one! The post also shares local WBN celebrations at one of our few remaining (but wonderful) book shops at Lee-on-Solent where local writer, Richard Hardie as part of the Authors Reach group, held a book celebration event. I think books should be celebrated all year but it is good to have a specific event which brings books to very public attention. Scam Alerts, written jointly by Richard Hardie and myself, is now up on the Chandler's Ford Today site. Richard, Authors Reach stalwart, YA author (of Temporal Detective Agency fame) and fellow CFT blogger, very kindly shared a blog post he wrote a while ago about email scams. This makes a good follow up to my Phone Scams article. I share some further thoughts and tips and I found a marvellous and very funny You Tube clip of a phone scammer who really did pick the wrong number to call. You should also listen to who this scammer claimed to be! My latest Chandler's Ford Today post called Phone Scams is now live on site. It is one of those sadly necessary posts and my only hope is it stops other people falling victim to the various nasty scams doing the rounds. Watching The Detectives is my latest Chandler's Ford Today post where I share my thoughts about J.B. Priestley's An Inspector Calls and name some of my favourite fictional detectives. I also share some favourite classic theme tunes linked to these detectives. History: News From Agincourt may seem to be 600 years late (!) but is, in fact, the title of my new Chandler's Ford Today post. The Road to Agincourt Project are launching a new woodland trail and an interactive map which can be worn as a scarf! Part 2 of my 50 Things I like about the Chandler's Ford area is now up on the website. I cover everything from a very good local chip shop to the fantastic avenues of oak trees in the area. I set myself a challenge after my 50th birthday recently to see if I could come up with 50 things I like about living in this area and was pleased to discover I could! (Mind I can think of several things I dislike too - the increasing number of potholes on our roads for one thing). My latest Chandler's Ford Today post is called 50 Things I Like about the Chandler's Ford Area Part 1. I wanted to write something to tie in with my 50th birthday earlier this week! Part 2 to follow next week. It was a great excuse to also comment on what a great local library we have and on the wildlife we have in the area. I've long believed in the therapeutic value of creative writing and my latest post on Chandler's Ford Today discusses this and shares some useful links. It also introduces a local company called Chocolate Muffin Publishing, who enable people with learning difficulties, dementia, children of all ages and so on to write their own stories and create books from them over a 5 weeks course. At the end of the course there is a book signing event to celebrate the achievement. To read more see Writing as Therapy: Introducing Chocolate Muffin Publishing. Had a wonderful and educational time at the Writers' Day on Getting Your Book into Print, which was run by the Association of Christian Writers. It was also lovely to leave the desk behind for a while and meet lovely new people as well as ending up going home with a clearer idea of the route I'd like to take. As You Like It...And I Did! is my current Chandler's Ford Today post and looks at Shakespeare's play, some of the history behind it and the recent National Theatre Live production I went to see recently. I'm a relatively late convert to the wonderful works of the Bard of Avon but better late than never! My current Chandler's Ford Today post is on writing and at the same time is also a historical post. Producing a Legend: Sir Bevis of Hampton shares news of a new comic book and play being produced about Sir Bevis, who was a legendary hero and whose stories were phenomenally popular in medieval times. Towns emerging in medieval times often adopted a mascot/emblem and Southampton adopted Sir Bevis. No doubt they wanted to be associated with his acts of derring do! The post also gives some historical background (Henry V, Agincourt, the discovery of the king's warship The Holigost in the Hamble River) and shares some wonderful artwork which will be appearing in the comic book called Blood and Valour. Hope you like the post. Unusually I have a second Chandler's Ford Today post to share with you. This is called Beware of Thieves using "Distraction Technique in Chandler's Ford. A friend of mine, sadly, has recently fallen foul of a card scam and wanted a warning to put out in the hope it can stop this kind of theft happening to someone else. The article also includes links to other useful articles as to what other cons can happen and I must thank my lovely editor, Janet Williams, for her assistance here. Hope you find the post useful. Sadly this kind of crime is something that goes beyond borders - local, national or international. A con is a con. My latest Chandler's Ford Today post is called National Theatre Live in Chandler's Ford and Eastleigh Areas. I discuss local shows but also the whole idea of National Theatre live, which I think is a good one. I hope to be writing a review of a recent NTL production of As You Like It and on my Fairytales With Bite website I have posted a short blog on my developing an appreciation of Shakespeare. Glad to say one of my darker 100 words stories, Pressing the Flesh, is now up on Cafelit. Hopefully more of my stories, light and dark, will appear on Cafelit throughout the year. I look at swimming and how it helps my writing in my latest Chandler's Ford Today post called Revamping Fleming Park. Fancy Swimming Alongside a Local Fiction Writer? The great thing is I'm not alone in this. P.G.Wodehouse and Lord Bryon were also devotees of swimming. I find one of the most important things a writer can do is give themselves thinking time. And swimming is a great way of doing this. My new Chandler's Ford Today post is called How Have Your Reading Habits Changed? and discusses the Kindle, books, magazines and traditional print. It also looks at tips how to encourage reluctant readers. And the comments spot has already expanded into discussing favourite characters. Hope you enjoy it. My new Chandler's Ford Today post looks at the ugliness and beauty of winter. Plus points = book reading and hot chocolate consumption. Bad points = the weather and pot holes! But beauty is in the eye of the beholder and my post talks about some of my favourite nature sightings during what is most people's least favourite season. Even in winter there are good things to spot. My short story, Three Wishes, is now up on Scriggler.com and am pleased/relieved to have first acceptance of the year! Feel I'm now underway for this year! My new Chandler's Ford Today post takes a look at different writing platforms, the history of writing and I share some of my thoughts on how dangerous writing can be. The post is Writing, Blogging, Social Media... What's Your Favourite Form of Writing? My latest Chandler's Ford Today post is my reflection on two men who worked magic with words, David Bowie and Alan Rickman. The post is called The Magic of Words and I hope you enjoy it. My latest Chandler's Ford Today post is called The Joy of Libraries and was a joy to write. It looks at what libraries still do for us and takes a brief peek behind the history of libraries. This is particularly relevant for my local area as the County Council (Hampshire) have just held a Draft Strategy Review looking at the library service and seeking people's views. I hope as many as possible told them! Shakespeare Inspirations: Hamlet at Thornden Hall went up on Chandler's Ford Today yesterday. It is a review of Hamlet from a writing perspective and I really loved writing it. Christmas Stories, Limericks and Traditions is my new post up on Chandler's Ford Today. Hope you enjoy it. I've written a few 100 words stories for this, as well as limericks commemorating the season. Have a wonderful Christmas and 2016! Two of my stories are now out in Stories in Green Ink, an anthology compiled by Anna Trowbridge. This is the third print anthology I've been in this year (making 2015 my best yet). The book is available in Kindle and paperback. The cover is stunning. Am really pleased with progress this year. Hope I can build on this for 2016. My new post on Chandler's Ford Today is a look back at my writing year, celebrates some of the joys of the small press and talks about writing success coming in steps. I also review the Bridge House/Cafelit joint book launch recently held in London. Part 2 of my interview with Richard Hardie is now up on Chandler's Ford Today. Richard shares useful writing tips in this post as well as bringing up to date news of how his Temporal Detective Agency novels for YA (Leap of Faith and Trouble with Swords) are doing. I love writer interviews - both conducting them and reading them - as I always learn something new that can help me improve what I do. Hope you like the posts. Pleased to report my new post, Further Adventures of a Fantasy Author, is now up on Chandler's Ford Today. As well as the link, I've tweeted about this at https://twitter.com/AllisonSymes1/status/672578489745317889. Facebook seems to have crashed (and not just for me) so hope to share Facebook link at another time. Am getting more used to Twitter, finally! Glad to report a short story of mine, Out of Time, is now up on the Scriggler.com site. See link. Hope you enjoy! Have needed to have a short break from Chandler's Ford Today due to the not unexpected loss of my mother (who gave me my love of reading and books) but hope to resume from the end of this week. More details later in the week I hope. Hampshire Historical Connections is my new post on Chandler's Ford Today. It is a general overview of some great places to visit in Southern Hampshire and I hope to write more about some of the places and their stories at a later date. Hidden Hampshire: The Monarch's Way is my new Chandler's Ford Today post. The Way follows the route King Charles II took after his defeat at the Battle of Worcester towards Brighton and life in exile in France until the restoration of the monarchy in 1660. My post looks at a section of the walk and the wildlife spotted in and around it. Despite its association with some turbulent history, the Way is a peaceful place and a great walk. From Dancer to Writer: Felicity Fair Thompson, is now up on the Chandler's Ford Today website. This is the final part of the interview I conducted with Felicity earlier this year and features her special moments as a writer and useful hints and advice for other writers. My post, Review: The Importance of Being Earnest at Thornden Hall, is now up on Chandler's Ford Today. I should add that Oscar Wilde's original did not have "at Thornden Hall" attached to it! Having said that the piece is a review of the play, gives a brief biography of Wilde, and reviews our local venue, Thornden Hall, which is trying to get itself better known as a venue for entertainment. The lovely Janet Williams, CFT's editor, and I hope they succeed as it is a great local venue. Am off to see Hamlet there later on. Looking forward to that but you really couldn't get a greater contrast in mood for two plays, could you? High Jinks at the Hiltingbury Extravaganza is now up on the Chandler's Ford Today website. It is a fun look back at our local show. Despite living in the area for decades, and the fact the show has run for many of those years, this was the first time I'd been to this. It's the first time I've been able to legitimately claim I was researching material (aka gossiping with those running the stalls!). My new post, High Jinks at the Hiltingbury Extravaganza, should appear tomorrow night. It is a review of our local show, which was huge fun and I hope it will generate more support for our local Scouts as they try to raise funds for rebuilding their HQ and for Thornden Hall, which stages wonderful productions and would like to be better known in the area. Tonight CFT's editor and I went to see The Importance of Being Earnest there and it was fabulous. Loved Oscar Wilde's wit in this. My new post, Hiltingbury Extravaganza: Talking Maths, is now up on the Chandler's Ford Today website, a day earlier than usual for my posts. This is mainly to keep it as close to the Extravaganza in terms of real time as possible. Despite living in our area for well over 25 years, last weekend was the first time I'd visited the show and it was huge fun. I went with Janet Williams, CFT's editor, and we had a lovely time gossiping (we think of it as researching!) with the people we met as we had a look at their stands and stalls. And the thought of educational stalls in amongst the hot dogs, rides etc makes such a good contrast, it simply had to be flagged up and written about. That's my excuse and I'm sticking to it! Hope you enjoy the piece anyway. Pleased to say my new post, Station Walks Review, is now up on the Chandler's Ford Today website. This book should appeal to train buffs and walkers (and combines two of my other interests. I adore train travel though concede doing this every day in central London is almost certainly not fun!). Also glad to say have been making more connections on Linkedin and Twitter recently. Have had some further good responses to my Scriggler poem. Delighted to say there has been a good response to Not The Way to Go, the poem I submitted to Scriggler. They tweeted about the poem and others have retweeted that (thanks, all!) so this has the potential to be my biggest audience for anything I've written to date. You may have guessed I am quite happy about this! Delighted to say my short story, The Magic Flute, will be included in The Best of Cafelit4, the annual anthology produced by Cafelit (no surprises there! The title does kind of give it away!). The launch will be in London in December and will be held jointly with the launch of Snowflakes, the latest Bridge House Publishing short story collection. Very much hope to go to the launch. Also yesterday submitted a poem, Not the Way to Go (my take on the Wizard of Oz story), to Scriggler, the US based online writing magazine. This is the first time I've submitted something internationally. So a productive weekend, all in all. New post up on Chandler's Ford Today is called Always Annoyed in August (Are Exams Easier?). This one is cry from the heart in defence of hardworking students everywhere and to suggest some ideas for help for those who need to improve their grades (and above all a plea not to panic as there is help out there). Incidentally I would say there is a definite improvement in standards having seen the GCSE English Language and Literature papers in the last couple of years or so. I liked the books chosen for the Literature paper (and finally got to read Of Mice and Men). It has been a busy couple of days on the Chandler's Ford Today website. The final parts of my interview with Gill James of Bridge House Publishing are now up on site. Part 1 (up on Friday 28th August) focussed on Gill's life as a creative writing lecturer and also shares many useful tips and how-to advice. Part 2 (up on Saturday 29th August) focussed on writer networking - both Gill and I hope fellow writers enjoy these posts and that readers get some ideas as to what goes on in a writer's head before their words hit the paper, screen or whatever! Tonight (Sunday 30th August), I'm pleased to share news of local author Richard Hardie's book signing and talk sessions at Chandler's Ford Library. My last article in my weekly summer series for Chandler's Ford Today, My Top Ten Terry Pratchett Characters, is now up on site. This was huge fun to write and find suitable links for. I resume fortnightly blogging after this. All of my summer pieces bar tonight's one started life as smaller pieces on both of my websites. Good adaptation practice! My new post, My Top Ten Reasons to Love Books, is now up on the Chandler's Ford Today website. This was a joy to write. I discuss book formats a little in this as well and I was pleased to find Michael Murpurgo's Radion 4 Extra broadcast about Sir Allen Lane, Penguins paperback founder. Very good programme (which I've linked to). Pleased Janet Williams, the lovely editor of Chandler's Ford Today, has credited Mike Sedgwick and I with co-editing a series of articles by Martin Napier on Growing Up in Chandler's Ford. Am very happy to recommend this series. Lovely easy read and great local history. Also nice from my viewpoint to have sneak previews at these posts and to use my editing skills outside of my own work. Also many congratulations to Chandler's Ford Library for being awarded Grade II Listed Building status recently. My post, My Favourite Fairytales, is now up on Chandler's Ford Today. Have shared links with it to Facebook and Twitter. Like the way Facebook brings up the visual link to the article when you put website address in. I also love the way CFT's editor finds wonderful thumbnail images as "tags" for the posts. I share one of my short stories, Job Satisfaction, on this post. Hope you enjoy! Have spent some time tonight adding a link from my Facebook Author Page to the home page for this website. Pleased it all works. Only sorry I didn't do this before. Have also added contacts within the social media buttons right at the top here. Should have done that before too! Writing wise, myext post on Chandler's Ford Today will be about my favourite fairytales and is due on site tomorrow. My new post, My Desert Island Books, is now up on the Chandler's Ford Today website. I really enjoyed writing this given I'm sharing some of my favourite stories. There will be a kind of mini series from me over the next few weeks before I resume my longer, fortnightly posts. Hope you enjoy all the pieces! There is a short post on Chandler's Ford Today from me tonight about a writer's talk being given by Linda Seger in Fareham on Saturday, 25th July. This is called The Writer's Process. Details were passed to me by Felicity Fair Thompson. So many thanks to her. I'm only sorry I can't go myself! My next scheduled post should be on tomorrow and this will be called My Desert Island Books. I'll put up the link after it goes live. I take a look at the joy of stories in general and name some of my favourites. This post was a real joy to write! Just back from a wonderful break in the NE of Scotland. Fantastic scenery, saw lots of wildlife and the air up there is wonderful (maybe being asthmatic makes me more appreciative of that?). Back to writing then but I love enjoy something it is no hardship to return to! (I did work on my short story collection whilst away but focussed mainly on catching up with some of my reading). Will have a new post up on Chandler's Ford Today later in the week, more details later. Nice comments coming in on my St. George's Parade article on Chandlers Ford Today. Thank you all. My next post on Chandlers Ford Today is on site tomorrow. Memories of Chandler's Ford St George's Parade: Lyn Darbyshire looks at the history behind St. George and I interview our former local District (Scouting) Commissioner who organized our local parade for many years. More details later in the week I hope but my next post on Chandlers Ford Today will be on site this coming Friday. The post will look at the legend of St. George and a behind the scenes glimpse into the St. George's Day Parade held locally. St. George must hold some kind of record for the number of countries, cities and causes for which he is patron saint! The editor of Chandlers Ford Today came up with an even better title for my latest article. Inspired by Slapton Beach: Felicity Fair Thompson is now up on site. Lots of photos and links and two fascinating stories - one is historical, one is fiction. And I must thank Felicity for opening my eyes to a World War 2 story that has been shrouded in secrecy and deserves to be better known. My next article, Writing History: Felicity Fair Thompson, should be up on Chandlers Ford Today as from tomorrow. I really enjoyed writing this piece as it combines two of my great loves - history and talking to another writer about what they are doing! Felicity has shared insights as to the joys and pitfalls of writing historical fiction, discusses her book The Kid on Slapton Beach, and I researched further into the story behind Slapton Beach. I discovered tragedy and a World War Two story that is still largely unknown. Hope you enjoy the piece. Thoroughly enjoyed my second day at the Winchester Writers' Festival. Topics today included whether to self publish or not, fantasy writing, short stories and how to get the best out of Twitter. (The latter had a wonderfully funny segment on 10 Things Not to Tweet. I've received most of them!). Have prepared a list of things to do as a result of the Festival and am pleased to say have carried out first one tonight. My Twitter profile now has a proper picture of yours truly on it so the egg symbol accompanying my tweets has finally gone. I've also updated my biography. Think it looks better. Had not realised the egg symbol on tweets can be treated like spam so appreciate the info from Emily Benet. Already looking forward to next year's Festival! Great first day at the Winchester Writers' Festival. I went to the Master Course called Going Public: Promotion and Performance. Learned at great deal. All of the exercises from preparing a press release to posture positions (which improve your breathing and therefore how you speak) were interesting and I'm sure are going to prove useful to me. Met another writer from Chandlers Ford. In all the years I've been attending the Festival, as it is now known, that is the first time that's happened! Recommended Chandlers Ford Today to her! Looking forward to tomorrow's main event. The highlight for me I think will be the Twitter for Writers talk. I am aware I could and should make better use of Twitter. (I was also very pleased as part of the course today involved reading text you brought in with you. I brought in an extract from Just Desserts, available on Alfie Dog (never waste a chance to plug! ), and the lady I partnered with for the exercises was kind enough to say she liked it. She felt I got into character as I read it. I did but it was an unconscious thing, which is, to me at least, a fascinating thing. It's good when your characters come to life like that). Very pleased at a kind and thoughtful comment by a non-writer to What's Your Story? Gill James on the Chandlers Ford Today website. Appreciation of the effort behind fiction is rare and highly valued! Feedback is always useful of course but it is nice when it is positive and realises writing is more than just stringing a few words together. Never underestimate the value of a good edit! Am delighted to say What's Your Story? Gill James is now up on the Chandlers Ford Today website. The link to the article is here. Hope you enjoy it. I loved the picture of the heavenly library. I think that image is going to stay with me for a long time. I have always loved reading other writers' thoughts and tips so it has been nice to write a piece where I can discuss some of these with another writer. And Gill's insights are particularly helpful given she has a lot of experience as an editor and publisher too. (You ignore the advice of a good editor at your own risk!). Have started work on some of the research for the next piece. I am really enjoying writing the blog posts. Have started work on some of the research for the next piece. My next post, What's Your Story? Gill James, should be up on the ﻿Chandlers Ford Today ﻿website from tomorrow (probably in the evening). This post shows Gill and I sharing writing thoughts and tips. Gill also shares insights into life as an author. Hope it goes down well. My interview with Lyn Darbyshire is now up on the ﻿Chandlers Ford Today﻿ website. The interview was huge fun to carry out, as was the additional research into some of the history of The Gang Show (locally and nationally). Lots of lovely audio and video clips form part of this interview and thank you to all who have commented already on the piece. One of the nicest things about the website as a whole is the way it encourages people to write in with their memories. Part 1 of my interview with Lyn Darbyshire and her role in The Gang Show is up on the Chandlers Ford Today website from tomorrow. As well as the interview, there is background information about the history of The Gang Show (nationally), which I found fascinating. Lots of nice audio and video clips for this one too. The interview with Felicity Fair Thompson is now up on the Chandlers Ford Today website (along with great ideas for days out, insprired by the various places FFT has produced work for). It was fascinating finding out what drove Felicity to start her own publishing firm. She has had a very wide ranging career in the arts and books and writing are her passion). It was a fun interview to do and I hope that comes across on screen. Hope you enjoy! My next post is due up on ﻿Chandlers Ford Today﻿ tomorrow (nice juxtaposition of timings there!). It will be part 1 of my interview with Felicity Fair Thompson, a writer friend and small publisher from the Isle of Wight whose commitment to the arts shows up in the wide variety of things she has done in the course of her career. (Everything from ballet dancing to creative writing teaching and quite a bit in between!). Felicity used to run the Isle of Wight Writers' Conference which is where I met Gill James of Bridge House Publishing. It truly is a small world. A mini blog post is up on the Chandlers Ford Today website advertising the Alfie Dog short story competition. I'm very grateful to CFT's editor who is keen to support local authors and celebrate reading and writing in general. Conducted my first face to face interview today. There should be 3 articles to come out of this. The interview was huge fun to do and the interviewee was lovely. She also made a smashing cup of tea (this always goes down well) and has lent to me various photos and newspaper articles which should illustrate these future articles wonderfully. Look forward to saying more about this in due course. Part 1 of my interview with Gill James of Bridge House Publishing is now up on the Chandlers Ford Today website. As well as looking at the joys and tribulations of small publishing, I like to think of the article as a general celebration of reading and writing in general. Glad to report one of my stories, Giving It A Rest, achieved a sale via Alfie Dog Fiction during April. Alfie Dog Fiction are also launching their International Short Story Prize competition. The first prize is £200 and publication of the author's short story collection. Closing date is 30th September. More details are on the website (see competitions section). Alfie Dog Fiction Competitions. My next article for Chandlers Ford Today is due on site tomorrow. I interviewed Gill James of Bridge House Publishing, a friend and my first editor, and tomorrow's post will look at her life as a small publisher. Further posts in May and June will look at her life as a creative writing lecturer and as an author. The interviews give a fascinating look into a very busy writing life and I really enjoyed doing these. Hope you enjoy reading them! Have drafted next article for ﻿Chandlers Ford Today﻿ but for the first time I've put in the images myself, thanks to excellent tuition from Janet Williams, the site's editor, a little while ago. I'm also beginning to get to grips with Word Press coding (CFT is hosted on WP). Hopefully all this will mean is I can submit a near complete article more quickly, once I've got used to the whole process, and will speed up final editing for Janet. Have booked my place at the Winchester Writers' Festival for this year. I hope to attend a course on the Friday as well go to the all day talks on the Saturday. Used the online booking system for the first time and this was nice and easy to navigate. Am looking forward to going to Winchester on the Friday and Saturday. It is a highlight of my writing year. My thanks go to Janet Williams, the CFT site editor, for putting me on to this. One of the great things of writing the blog for CFT is I am learning a lot of skills which will help with my own websites and other work. So thanks, Janet! No Books = No Movies? is up on the Chandlers Ford Today website. It is the first post where I've embedded some clips as well as pictures thanks to the excellent tuition from the site's editor yesterday. My next article, No Books = No Movies?, is due online tomorrow on Chandlers Ford Today. Met the site's lovely editor today and learned lots about embedding images, HTML coding and YouTube clips. I was also spoilt rotten with tea and chocolate. I hope to meet said editor again soon! Meanwhile, hope you enjoy the article. Pleased to say my short story, Just Desserts, is up on the Alfie Dog Fiction site and tells Snow White's story from the viewpoint of the embittered stepmother. Have updated my Linkedin profile to include links to Alfie Dog Fiction, Chandlers Ford Today, the Society of Authors and the Association of Christian Writers. Very pleased to say that the Society of Authors has approved my upgrade to Full Member of the Society today. It's official - I am a writer! Have updated my writer's profile on their website. Will need to update my writing CV but this is a red letter day for me. Gill James put on Twitter details of a micro story competition so thought I'd use a piece I prepared some time ago as an example of a very short tale. The story had to be submitted by email. From reading Gill's tweet to submitting my story took just over 5 minutes. This is likely to be the quickest submission I have ever made or am every likely to make! The piece involves Eileen and Jenny just as the latter is getting used to the idea of being a fairy godmother's daughter and is called A Long Day. If the story does well, it will be read out by professional actors and circulated online. Thought I had nothing to lose! Have had some good responses to the Doctor Who Experience article. Composed a tweet yesterday regarding changes to the websites and now having the one link to the Chandlers Ford Today website. The Doctor Who Experience is up on the Chandlers Ford Today website. The editor has put in some wonderful images (gettyimages) and links (though I was pleased to embed one getty image myself thanks to her excellent tutorial!). Most of the pictures were taken by me on my mobile. Hope you like the article. Have thrown open questions at the end asking people to name their favourite Doctor, villain and classic episode. My review of the Doctor Who Experience should be on the Chandlers Ford Today website tomorrow. This was very much a labour of love. Hope you enjoy it. Am making progress on work I hope to submit as competition entries for the Winchester Writers' Festival. My guest post is up on the Alfie Dog Fiction site and Gill James, of Bridge House Publishing, has kindly written a few words about it and shared it on Facebook. Have been in contact with another author friend, from years back, who I may well be interviewing for Chandlers Ford Today. Am enjoying the feeling my writing is beginning to get somewhere... though still conscious for any writer it is always one hell of a long road to travel! Alfie Dog Fiction is due to publish my guest blog spot from me later on today. Will hopefully put up a link later on. Am delighted to announce Alfie Dog Fiction is due to publish a guest blog spot from me on Thursday 26th March. They regularly throw open questions to writers to make us think about what we're doing and why and to have a chance to speak out on projects we are working on. I love answering these Q&A sessions. Many thanks to family and friends and FB friends for birthday wishes. Much appreciated. Have heard from Richard Hardie that the tribute article to Terry Pratchett, with links, is now on the new edition of Discworld Monthly. Hope people like it. Have also heard from Richard, and directly via another contact of mind, that The Shamblelurklers Return has also managed to get a few more sales. Hope it continues to make progress for the National Autistic Society. The interview with Richard Hardie is up on site. Author pictures were supplied by Richard and, as ever, I am grateful to the editor of Chandlers Ford Today for her wonderful work with links, sourcing other pictures and so on. Really pleased to link back in this article to The Shambelurklers Return, where Richard and I both have work published. Hope it boosts sales though I have heard directly and via Richard that sales are picking up on this. So hopefully that will mean more money for the National Autistic Society. Am starting to prepare two further Q&A interviews for future CFT articles. Feel writing is beginning to take off a bit - am loving it! My interview with Richard Hardie should be up on the Chandlers Ford Today site tomorrow. It was huge fun to do and hope it gives some insight into a working writer's life. My next Chandlers Ford Today article is an interview with local author, Richard Hardie, and this is due to appear on Friday. As part of that discussion, we talked about favourite authors and we felt, given recent news, the section where we discuss our mutual admiration for Terry Pratchett's Discworld novels would make a simple tribute to the funniest writer this country has produced since Wodehouse. Very pleased with nice responses to Jane Austen article. Nice to be able to plug Bridge House Publishing too. Have had responses back from the local author who I've interviewed for the CFT site. I have always loved reading writer interviews. It turns out I like conducting them too! More details on this article nearer the time. Now back to the short stories! Jane Austen: An Appreciation is up on the Chandlers Ford Today website. My thanks, as ever, go to Janet Williams, the site's editor, for her great work in providing the images and links. Pride and Prejudice remains one of my favourite novels and I love the fact that while the world has moved on, the wit and irony in this book does not date. New article should be up on Chandlers Ford Today at some point tomorrow evening and is about Jane Austen and how Pride and Prejudice is one of my life changing books. Have also conducted my first Q&A with another local writer, who has some really good new about his books, which I hope will be my next article for 20th March. More, as they say, later. Have almost finished article for next Chandlers Ford Today website (and which should appear on Friday 6th March). But I already have the following article lined up and this will be a Q&A article with another writer. Should be huge fun to do. Will reveal more later. Feel my writing is expanding. This is a good thing! New article is up on the Chandlers Ford Today website. My thanks, as ever, go to the site's editor for putting the finishing touches to it (i.e. sourcing pictures though for this particular article the dog ones are my photos). See blog section of the site. I am enjoying writing for this site. I love the diversity of articles on it and think it is a really great example of a good community website. Writing for this site is also teaching me how to think visually, which is no bad thing! New post will be on the Chandlers Ford Today website tomorrow. I intend to write a mixture of articles which deal with local links, books and my writing. Hope it will be an interesting mix. Certainly I'm learning a lot about blogging and thinking visually to enhance what I write. New post is on Chandlers Ford Today website. The link is http://chandlersfordtoday.co.uk/allison-symes-book-review-the-daughter-of-time-by-josephine-tey/ and I must say I'm really pleased with the splendid job the editor, Janet Williams, has done to make this post attractive on the eye and ear. Hope you enjoy! A new post by me should appear on Chandlers Ford Today tomorrow (probably in the evening). It's about how one novel changed my mind about the identity of a murderer. I'm planning to blog on a wide variety of topics but I can see a mini series emerging about books that have influenced me in some way. I'm hoping tomorrow's post will encourage readers to write in with books that have influenced them and get a good conversation going but we shall see. Thoroughly enjoyed writing this particular article. Am so pleased that CFT are giving local people, especially local writers, a voice. Gill James, in her Gill's News newsletter, has put up a link to my review of The Best of Cafe Lit 3. Looks really good. Iron Press were pleased with my mention of Limerick Nation in Writing Magazine. (There was a mention of them separately in the same issue). Iron Press will be launching the book at a festival in June at Cullercoats but it is a bit far for me to go from Hampshire so have selected their option of having another poet read my limerick (if chosen) given I can't get there. I've suggested to them that I could put out some flyers at the Winchester Writers' Festival in June (they are very good at encouraging authors to put out flyers, bookmarks etc on their Bookfair tables) and Iron Press will try and send me something to put out later in the year. Iron Press have invited me to read my contribution to their Limerick Nation volume at the launch in Cullercoats in June. Sadly I can't go (bit too far to travel from Hampshire) but I have confirmed I would be happy if another poet read my contribution (if selected) as they asked for confirmation of that. Though sorry I can't go, I was thrilled to be asked. And I hope the launch goes well. Hopefully there will be links I can put up after the event. Finalized the review of The Best of Cafe Lit 3 and emailed it off to the editor. She loved it and an abbreviated version of the review is now on Amazon. The book has a wonderful collection of 100 word pieces and standard length magazine stories and I can't recommend it highly enough. The stories suit every mood and one short piece in particular turned the mood of the story and made me physically shudder in its last six words! This is only the second review of anything I've done and am glad it went down well. All those years of reading book blurbs and reviews paid off! It was also interesting looking at the book, not from the viewpoint of the author who wants to get work in there, but from those judging what should go in and I hope I can take what I learned here and use it to improve my own stories. New post on the Chandlers Ford Today site on theme of travel/days out with an emphasis on our local railway station/attitudes to travel and why I've never flown despite living near an airport. The lovely editor, Janet Williams, has done a fantastic job with photos and videos interspersed with my text. Am working on the next article which will be, to quote Monty Python, completely different. Am really enjoying writing these articles. Pleased a near neighbour has had one of her poems published in Writers' Forum. I don't think our area will ever be the definitive hub of the creative arts but it's always good to get work out there (and the next best thing is when friends do!). Marit Meredith, editor of The Shambelurklers Return, has kindly put a photo of my piece in Writing Magazine about that book (and my limerick in Limerick Nation) up on Facebook. Nice to see friends and neighbours liking said piece, thank you all! Another article from me is due to appear on the Chandlers Ford website tomorrow and after that I plan to be blogging every other Friday on that site on life in Chandlers Ford, writing etc. First of a regular series (fortnightly) of blogs for Chandlers Ford Today online magazine will be appearing, all being well, on Friday and every other Friday after that. Very pleased with this. All good writing practice! Have got plenty of ideas to be starting off with. I love brainstorming sessions. It's amazing what you can come up with sometimes - ideas you didn't think you had in you! Richard Hardie has sent me a copy of a photo of our local W.H. Smiths as they now have a shelf for his books, Leap of Faith and The Trouble With Swords, and alongside them copies of The Shambelurklers Return. There is also a nice notice saying the latter is raising money for the National Autistic Society. Writing Magazine has published my piece in the Members' News section about Limerick Nation and The Shambelurklers Return. The Chandlers Ford Today website has a blog post entitled 6 Things That Make Chandlers Ford. Under item 5 are books and writing in general and am pleased to say The Shambelurklers Returns is on there with a very nice publicity shot of the book on display with a poster at the local W.H. Smiths. The books alongside (Leap of Faith and Trouble With Swords) are written by friend and neighbour, Richard Hardie, who also contributed to Shamblelurklers. Every little bit of publicity helps! Merry Christmas and a Happy New Year to all. Hope you receive plenty of books and stories in amongst the other presents! I aim to be back on line in a couple of days. My project for 2015 will be a collection of my short stories. Am looking forward to cracking on with this. Look out for two Christmas limericks which are due to go up on the Chandlers Ford Today website on Christmas Eve. Hope you will enjoy. They were huge fun to write. Christian Writer, the quarterly magazine of the Association of Christian Writers, published my short piece plugging Limerick Nation, in which I have a limerick about Hampshire, and Out of Time, my short story for The Shambelurklers Return. My article, What Christmas Means to Me, is now up on the Chandlers Ford Today website. I've put up a separate direct link from here. I loved writing the article and am absolutely thrilled with how CFT's editor has enhanced the article with lots of You Tube clips and so on. Am learning a lot about blogging from working with her on this site. As for yesterday's day out, I've realised when I was talking with various people, that although I've not entered so many writing competitions this year, I have had a higher "hit rate". There's a moral there I think. Many thanks to Gill James and Debz Hobbs-Wyatt for organizing the Bridge House Authors Celebration in London today. A great time was had by all and it is always great to get together with fellow writers. Given the event was held near Charing Cross/Trafalgar Square even got to do a bit of "tourist" sightseeing on the way to and from the do. Reminded I must go and visit the National Portrait Gallery. Back to the do. I didn't take part in the readings but loved the stories and poems I heard. I can't recall the last time I was "read to". Everyone who did read "performed" their stories/poems and it was one highlight of the afternoon for me. Hope we can get together again like that, folks, hint hint! My short story, A Day Out, is now up on the Cafe Lit website as one of their advent stories. Really pleased. 100 word short stories are a good challenge for the brain! My fantasy dinner party guest list is now up on the Alfie Dog website under their Bites section. I've put up a separate direct link to it. It was huge fun thinking of who to invite and why and naturally, for someone who loves books and music, authors and musicians make it on to my list. Have updated one of my external links so it takes you straight to an interview conducted by Janet Williams with me. Please see the Chandlers Ford Today link. My review of Jeeves and Wooster in Perfect Nonsense is now up on the Chandlers Ford Today website. I saw the show at The Mayflower, Southampton last Tuesday and it is a wonderful script, performed by three excellent actors. Delighted by how CFT's editor has put in pictures of Wodehouse, subheadings and a trailer for the show as all of these make the article look more attractive and easier to read. (It is my first ever review of anything too). Pity the show is only on down South for a few days as it tours UK. I very much hope it will be back. Chandlers Ford Today has amended its home page so it now has a rolling picture gallery of various things/people connected to the site. My author with her books shot is in the gallery and the link to my interviews is part of a menu of things to read. Feel very flattered. Part 2 of my interview by Janet Williams of Chandlers Ford Today is up on site now. Particularly pleased with big picture showing the front cover of The Shambelurklers Return, which is raising money for the National Autistic Society. Part 1 of my interview by Janet Williams of Chandlers Ford Today is up on site. Really delighted with how she's interspersed the questions with pictures, You Tube clips and so on. A Q&A for Chandlers Ford Today (online magazine) has been accepted by them but will be split into two pieces. One half will deal with local links and my background, the other with me as writer. More news (and I hope to add external link) once the piece is up. The nice thing it is it is the first "proper" interview conducted by them in this way and it is my first "proper" interview at all! Christian Writer (Association of Christian Writers) will publish a short piece on Limerick Nation and Shambelurkers Return. Pleased to say I've received my first royalty statement from Alfie Dog Fiction and hope it won't be my last! Got play out, The Moon's Advocate, off to BBC. Pleased with how play went. BBC online submission system easy to operate. Also got a spoof short story out, The Selfish Fairy, to Words with Jam. Now to hope they both do okay! I've put one of my short stories on as part of my blog. Just Desserts is a fun take on the evil stepmother's story. She, of all characters, doesn't believe only Snow White has the right to be heard! Shambelurkling Returns now available from Lulu. ISBN = 978-1-326 - 00283-1. Have published Limerick Nation, which "limericks" the country. I cover Hampshire! Copies available from the website. Iron Press have been supporting new writing since 1973 and are supported by the Arts Council. Alfie Dog, Bridge House Publishing, Cafe Lit, Iron Press and Shortbread Short Stories. Shambelurking Returns - my short story, Out of Time, is in there. All proceeds go to the National Autistic Society.